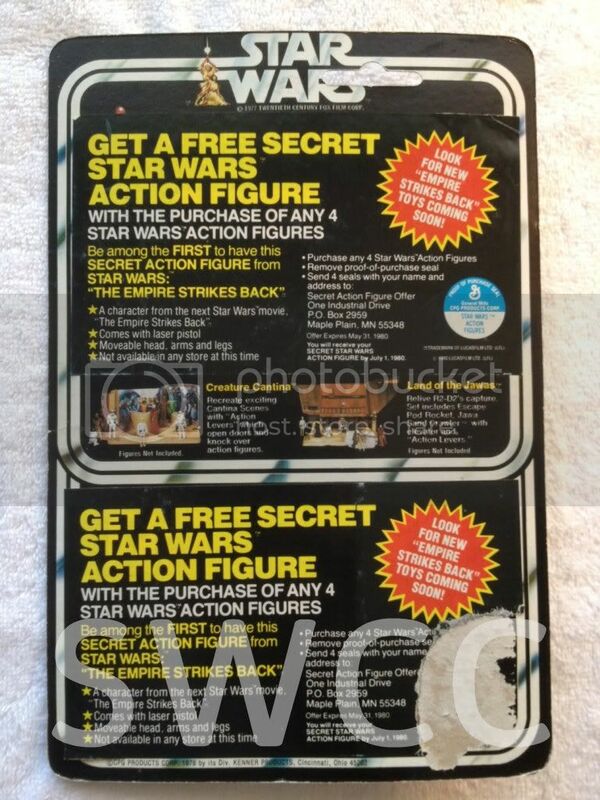 This thread is to help save all of the useful information posted over at the now sadly defunct SWCC website before it closed. 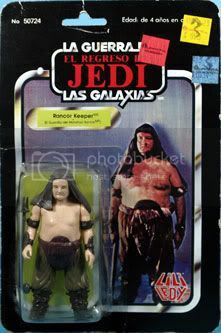 Thanks to jimbody1 for the contributions. 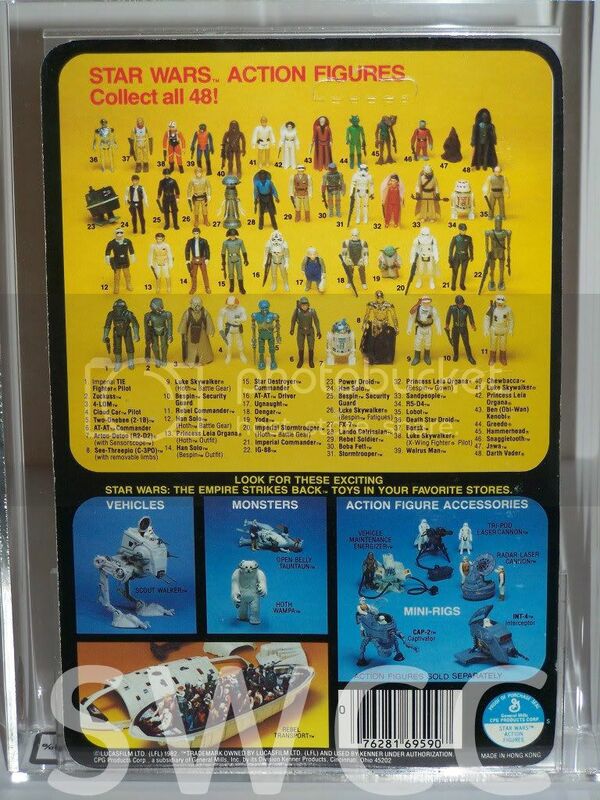 jimbody1 wrote: the aim of this visual guide is to try and create a definitive list of carbacks and their variations as most if not all previous guides are usually incomplete some are totally new and are not found in the kellerman book so any new designations here follow on from his work. 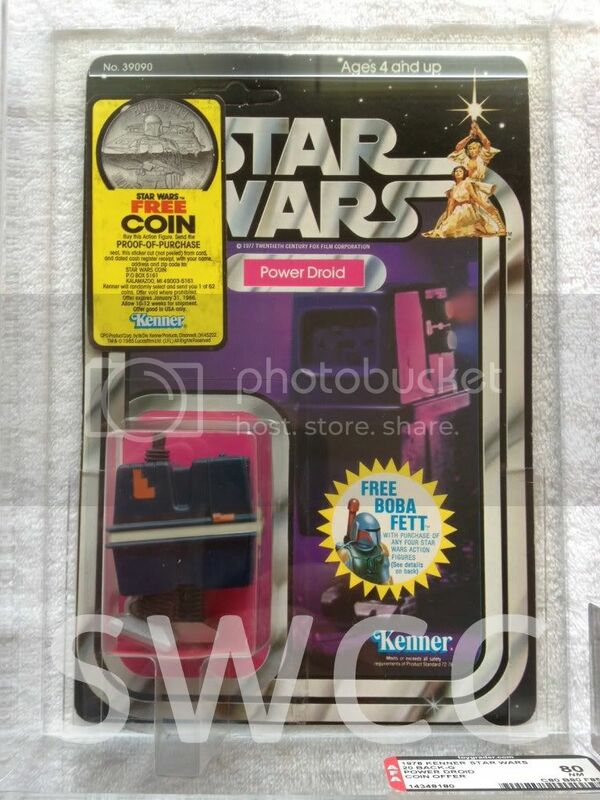 new and unique items appear all the time so this is always going to be a work in progress, if you have any that you think should be included please let me know the aim is to include all the kenner offers, any other non kenner offers will be put in a thread of their own. 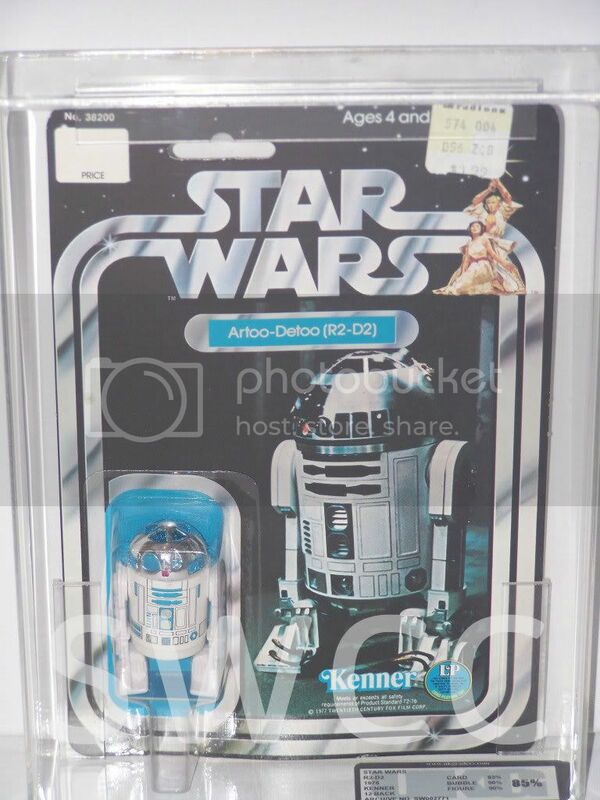 12 A the card is offerless and has the price tag box in the top left of the card, the very early 12 a's had an sku code on the footer as can be seen in this example but most 12 a's didnt have this after the initial run. 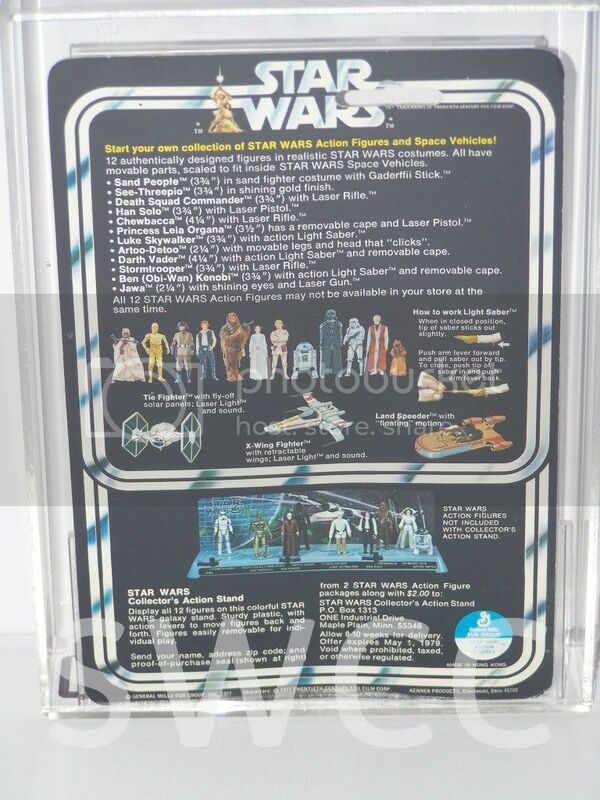 12 C the front again is exactly the same as the 12 a and b but again the cardback itself is different from both as the instructions have now changed for the telescoping sabre although the offer for the display stand is the same as the 12 b. 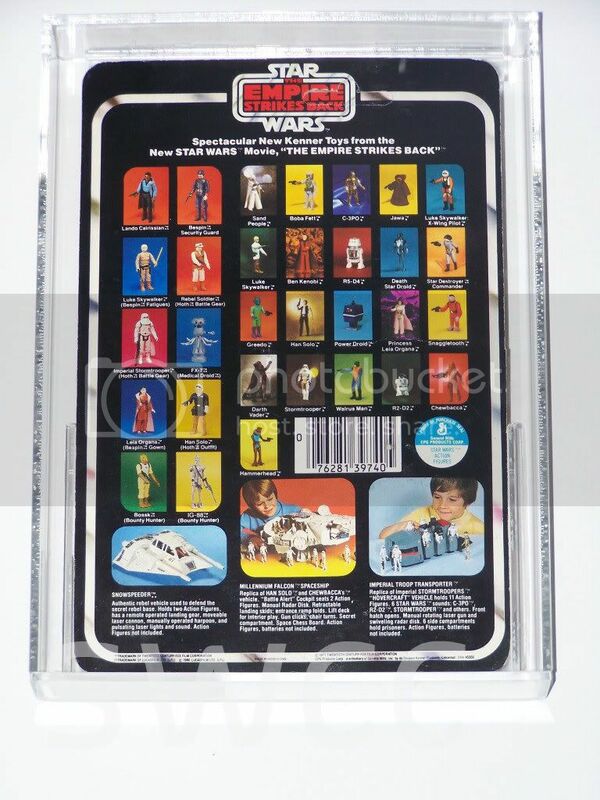 12 D the front is the same as the 12 a, b and c but the back has a sticker showing photos of another 20 figures over the display stand offer in essence making it a 32 back, this has been found over a, b, and c backs but is most common on a and b backs. 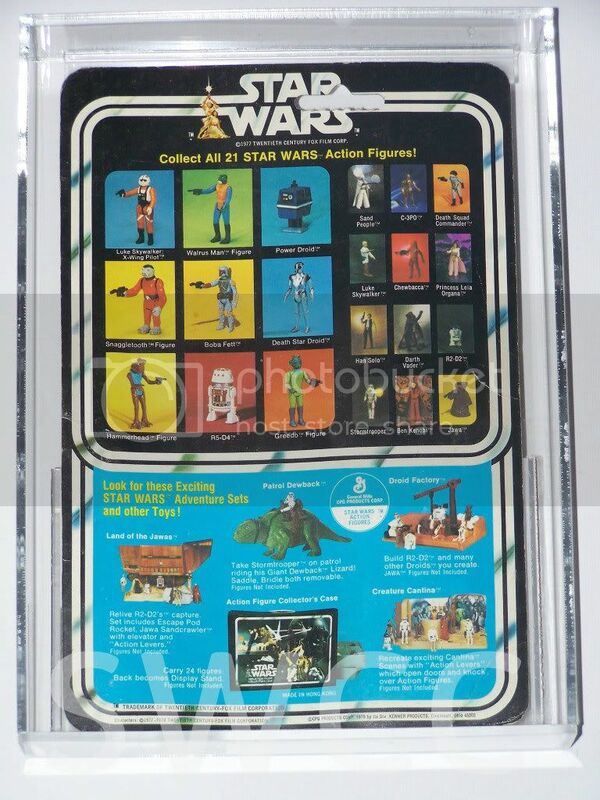 20 A the 20 back a front is the same as the 12 a, b,c and d but the back now shows eight new figures above photos of the original twelve, the playsets shown on the back are droid factory, creature cantina, dewback, land of the jawas and a collectors figure case. 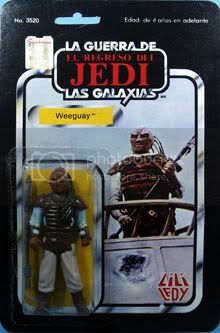 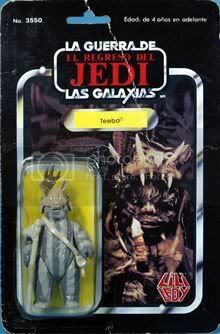 it should be noted that the land of the jawas and the creature cantina are the prototypes and not he production playsets. 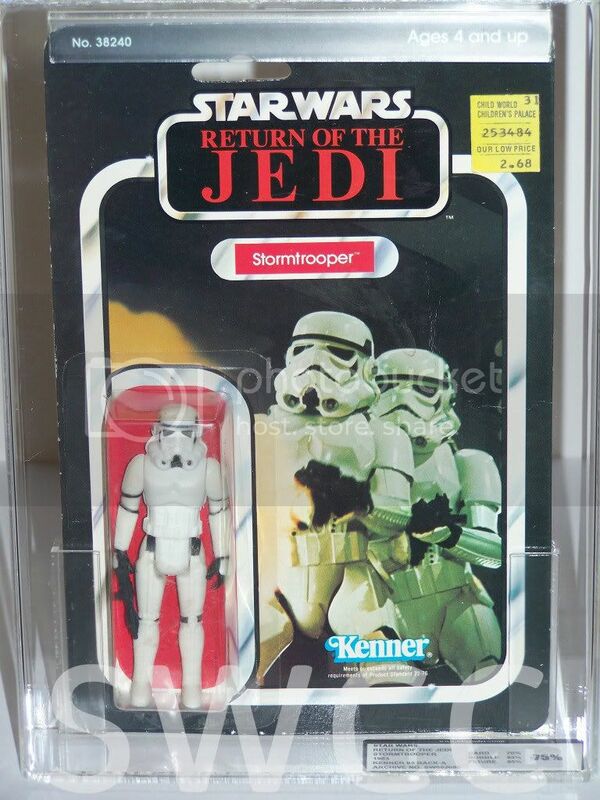 20 B the front of the 20 b had only two minor changes which are the removal of the price tag box in the top left corner and the long play logo next to the kenner logo on the bottom of the card as can be seen here. 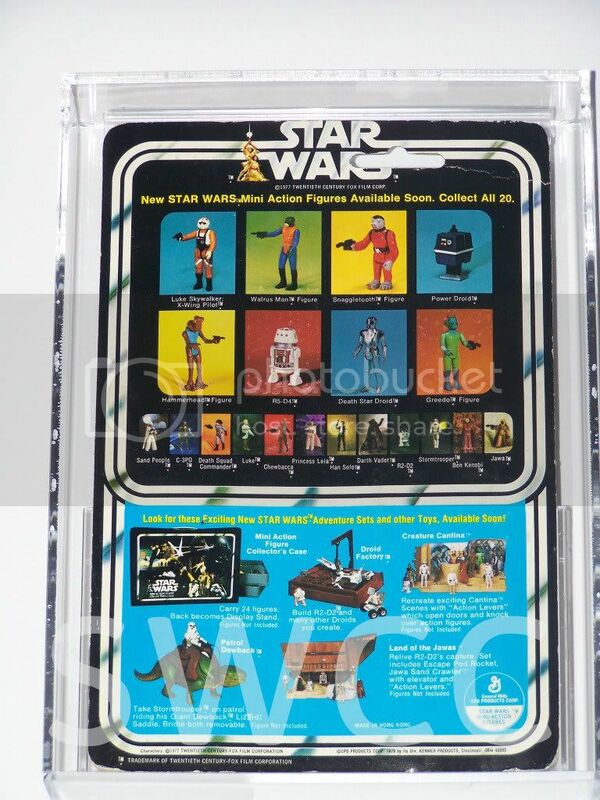 the back of the card is exactly the same as the 20 a exept the land of the jawas and the creature cantina playsets shown are now the production models and not the prototypes and have slightly different descriptions. 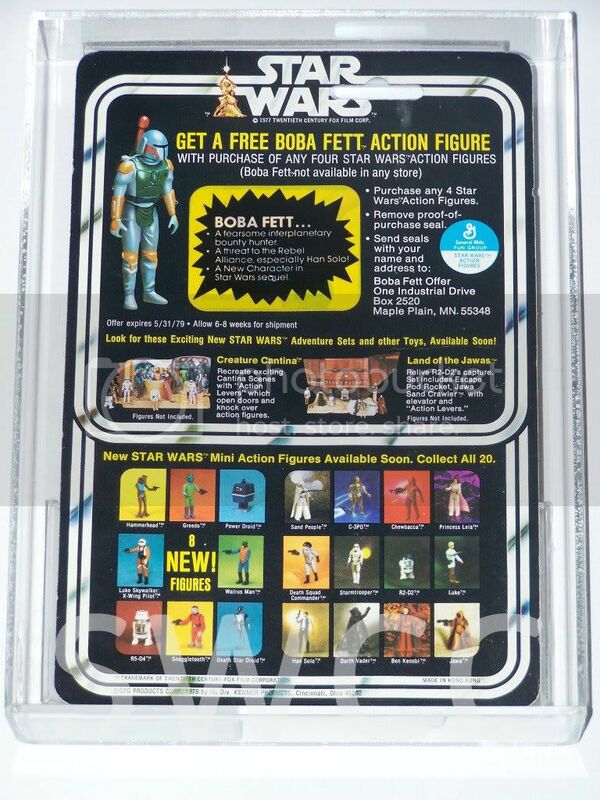 20 C front is the same as the 20 b exept for the starburst for the free rocket firing boba fett offer which is printed on the card. 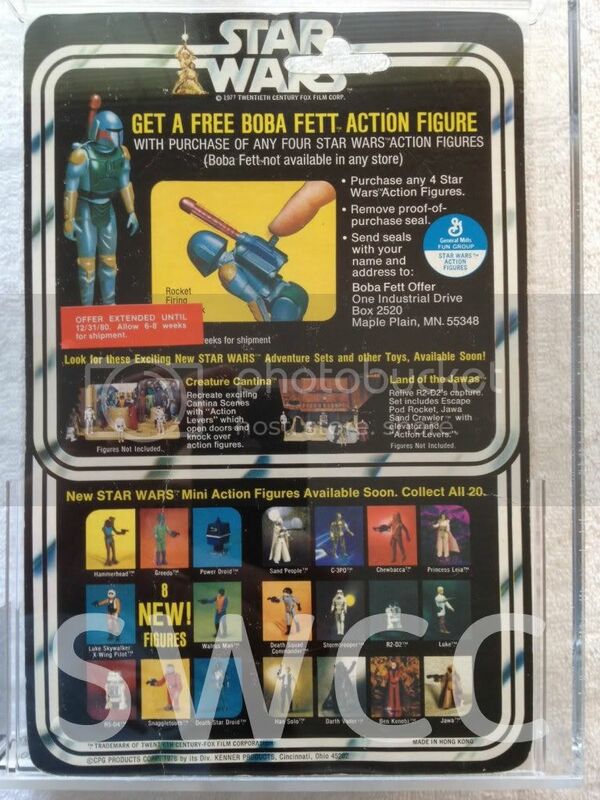 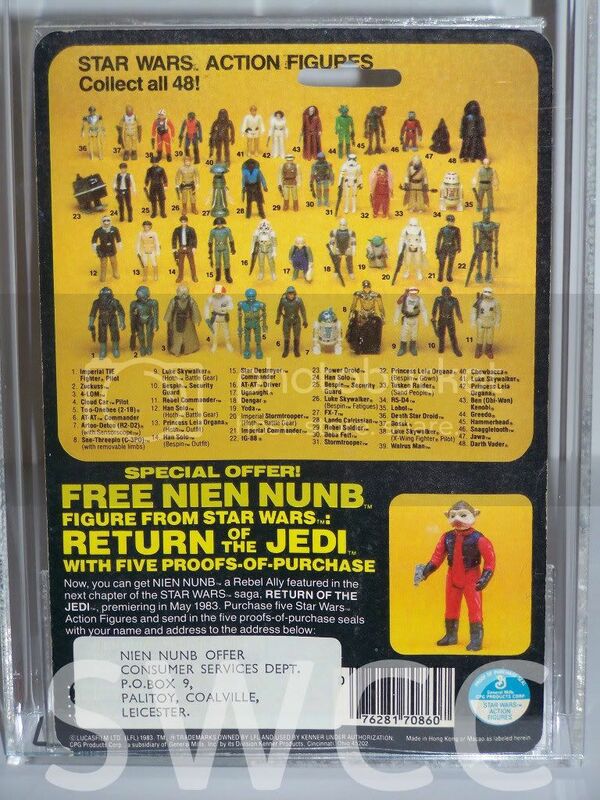 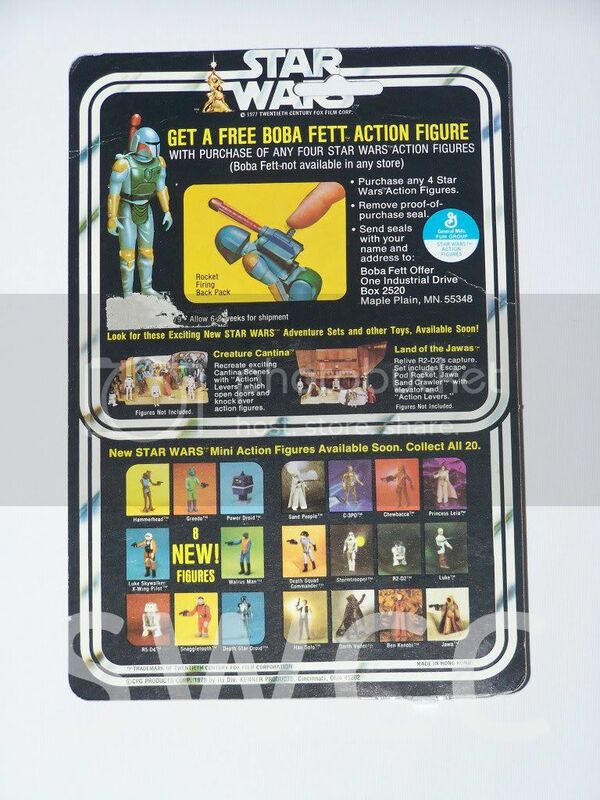 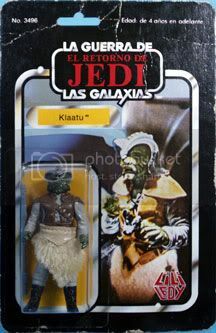 the back has photos of the 20 figures at the bottom with the boba fett offer details on the top of the card which also shows a picture of the rocket firing figure. 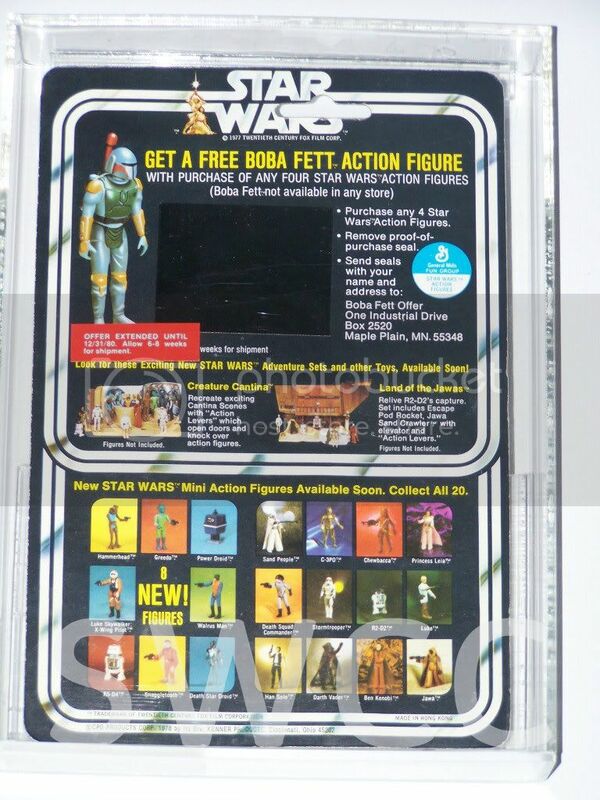 20 D front and back is the same as the 20 c but the picture of the rocket firing fett has a black sticker over it as the figure never went into production. 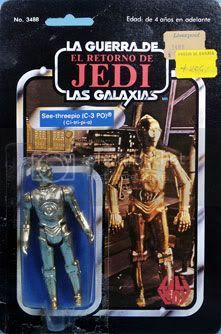 20 E front and back are the same as the 20 c but the black sticker has now been replaced by a yellow and black sticker with rounded corners giving details of the new figure. 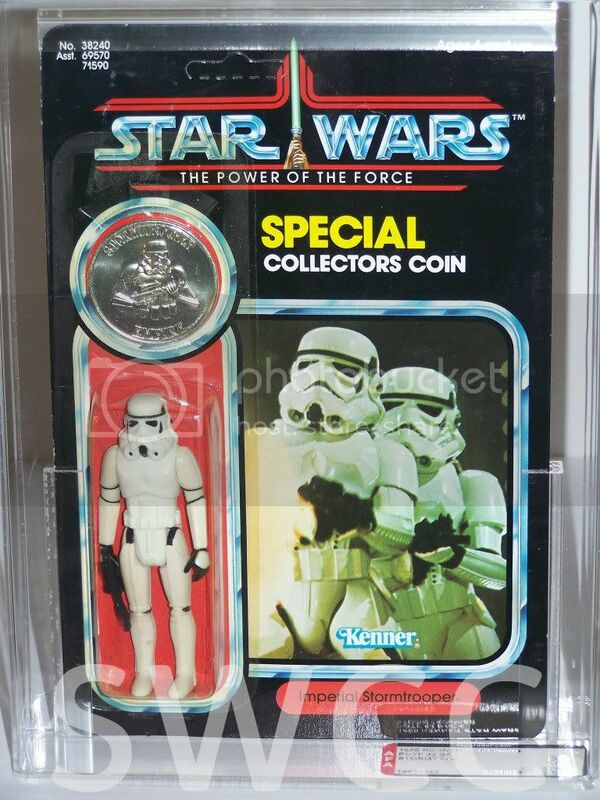 on this little known 20 e example there is a coin offer sticker which was only run much later in the rotj line, this was probably old stock and the sticker was probably applied much later but this makes it very rare and unique amoung 20 backs, however as its cardback is not unique to any other 20 back it is still essentially a 20 e and therefore will not receive its own designation. 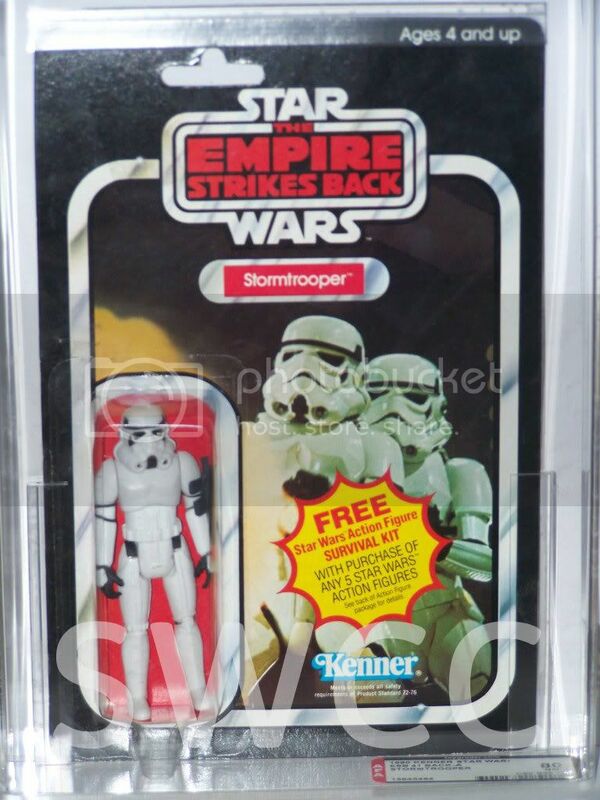 20 F front is the same as the 20 c but the back has the black sticker with the round offer extention sticker added. 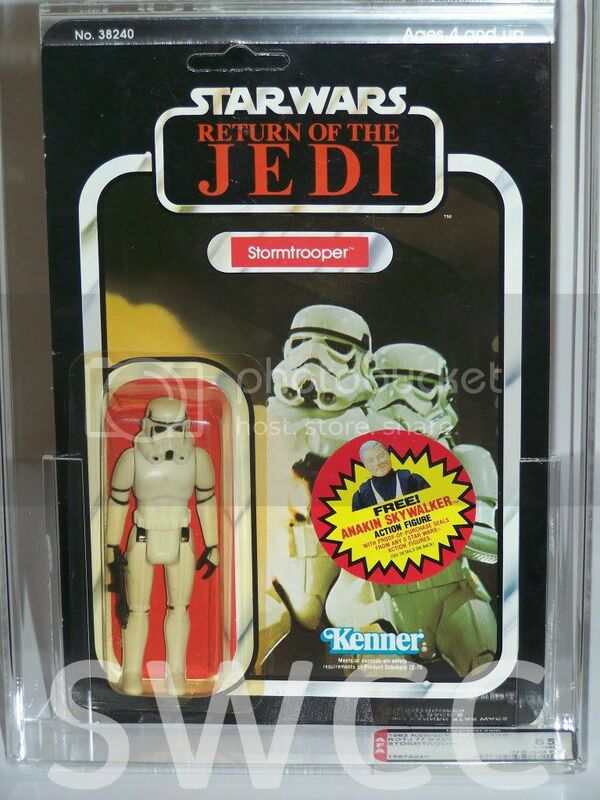 20 G front and back are the same as the 20 c but the sticker on the back has now been replaced with the same but with square corners ( can also be found with rounded corners )and a round offer extended sticker has been added. 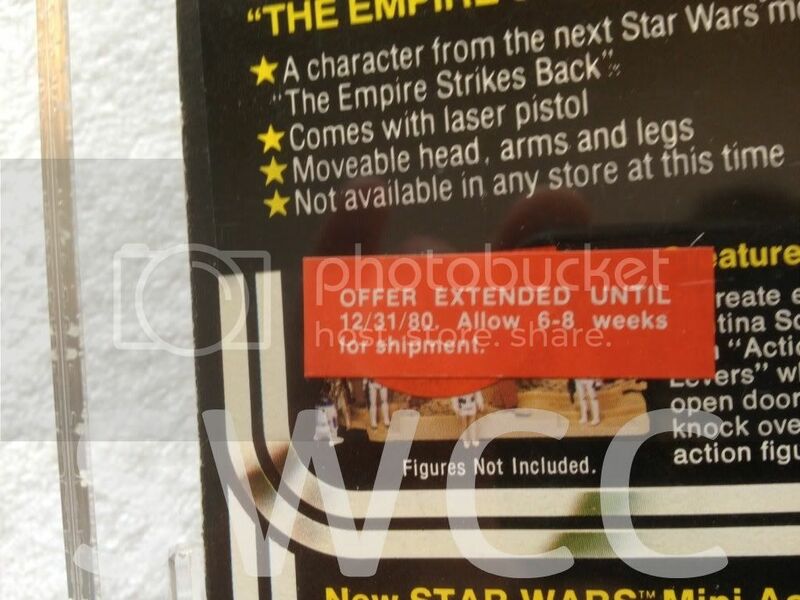 20 H front is the same as the 20 c but the back has the yellow and black sticker and a round offer extention sticker with the addition of a rectangular sticker extending the offer for longer over the top. 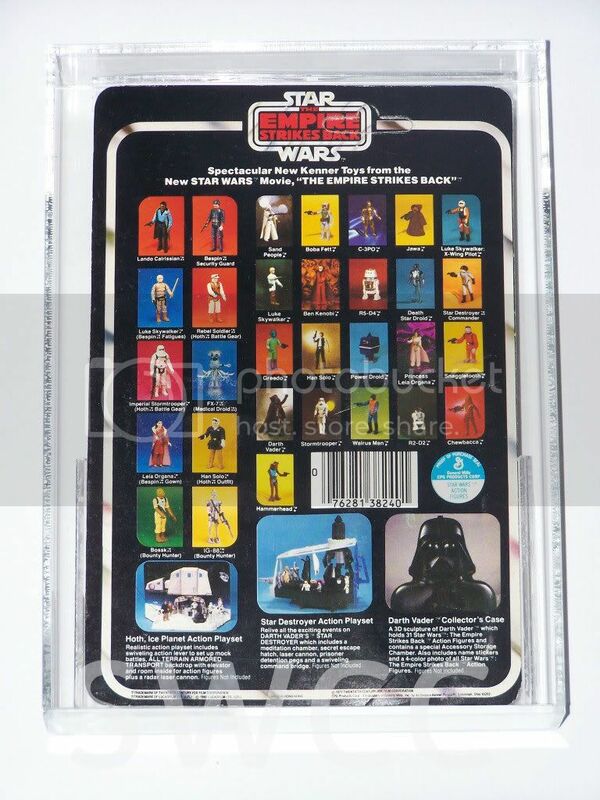 20 I front and back are the same as the 20 c but the sticker on the back has now been replaced for a black sticker with a rectangular sticker extending the offer. 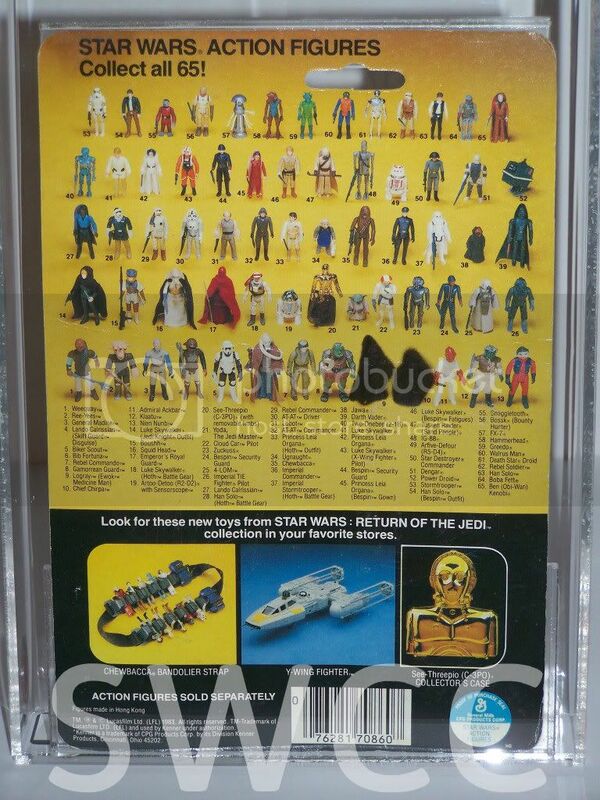 20 J front and back the are the same as the 20 c but the sticker on the back has now been replaced with a yellow and black sticker with square corners and the small rectangular sticker exending the offer. 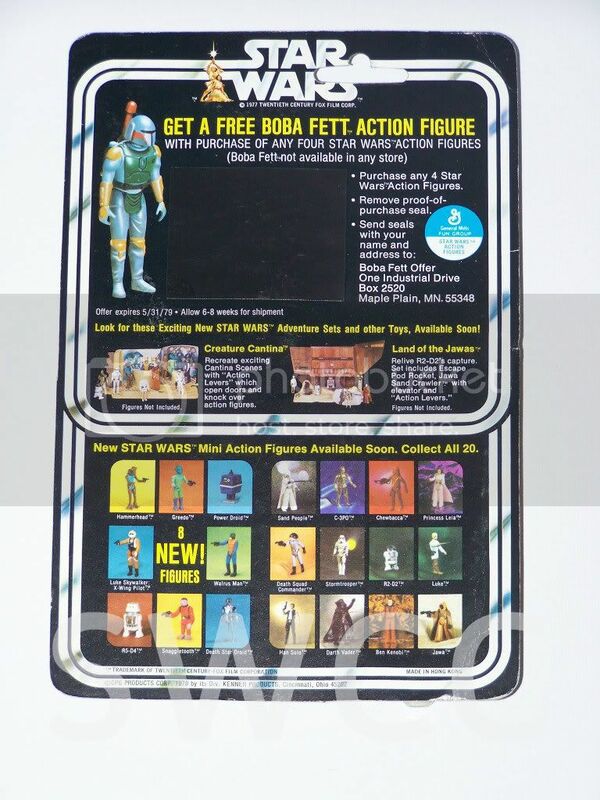 20 K front has a yellow starburst sticker with a deep round border covering the fett offer on the front but is otherwise the same as the 20 c.
the back of the card now has a sticker covering the boba fett offer totally but still shows the cantina and land of the jawas playsets. 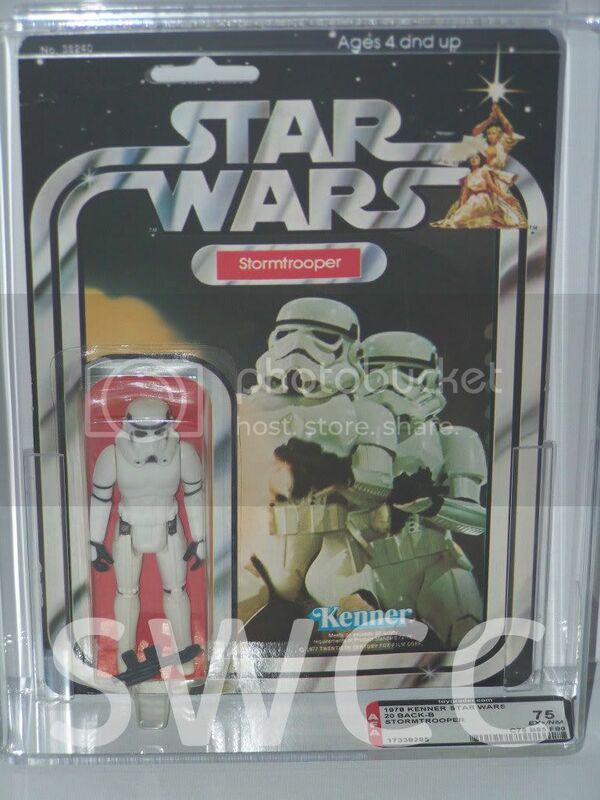 the sticker has also been found across the bottom and in one case two of the same sticker on the top and bottom of the card ( k1 ). 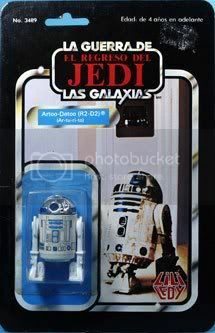 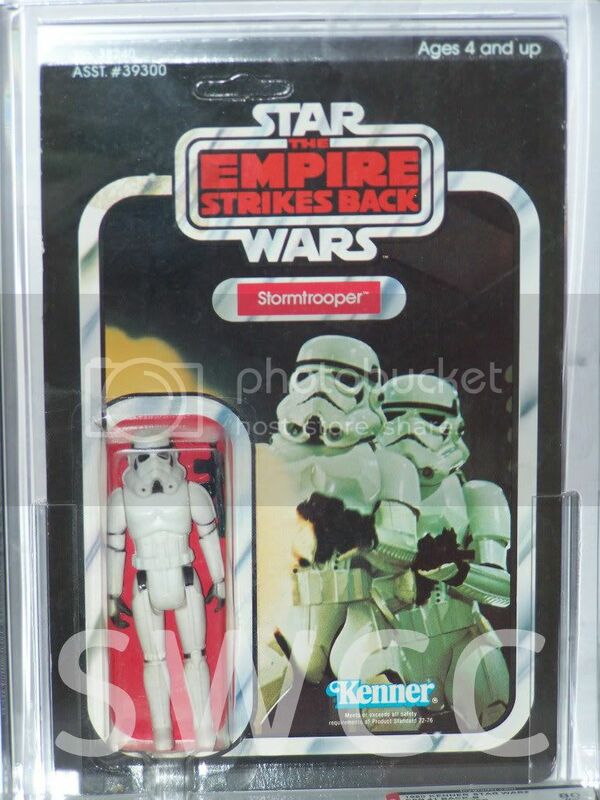 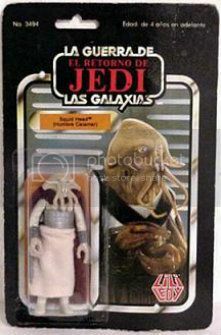 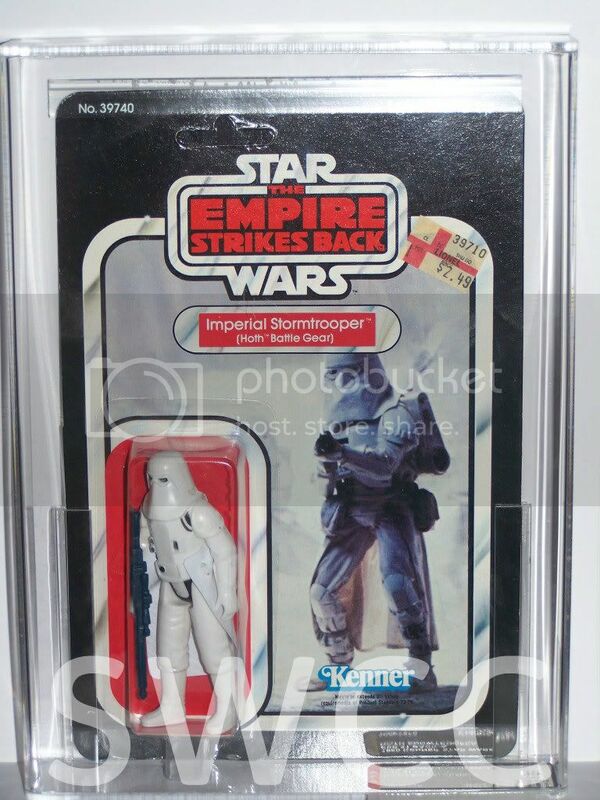 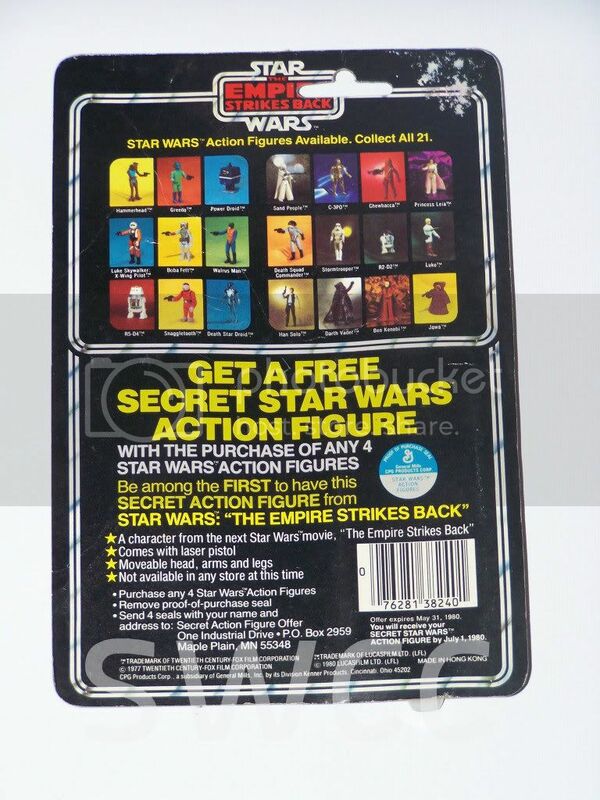 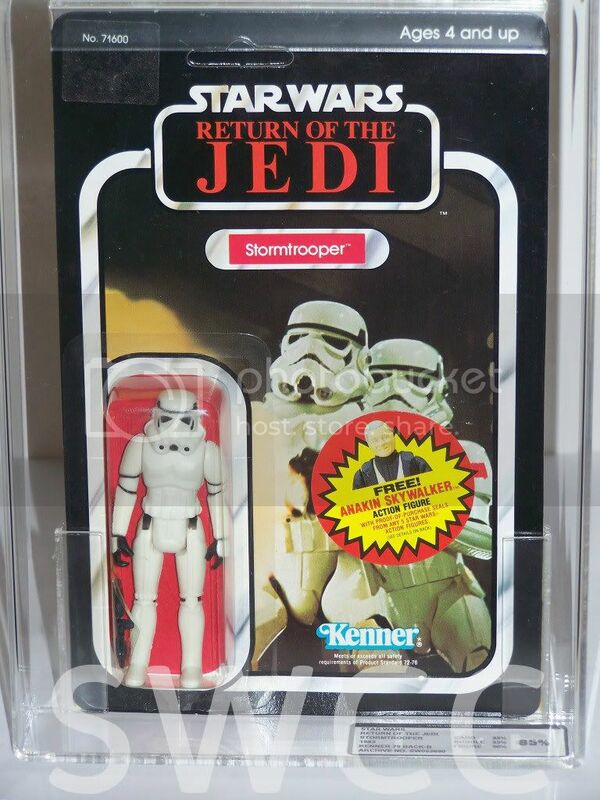 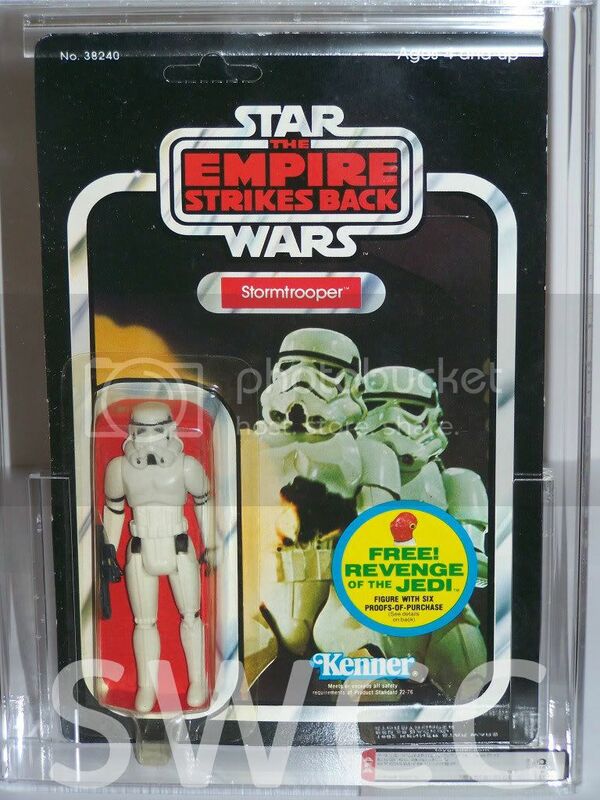 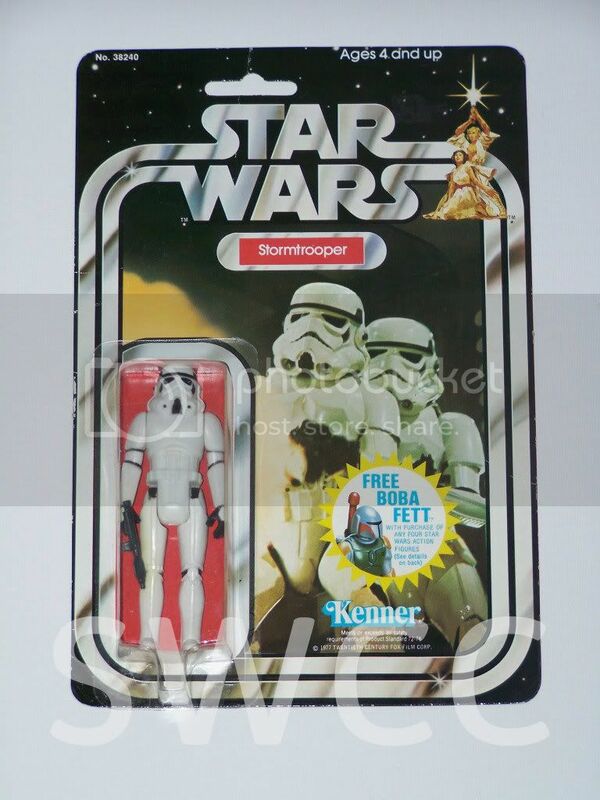 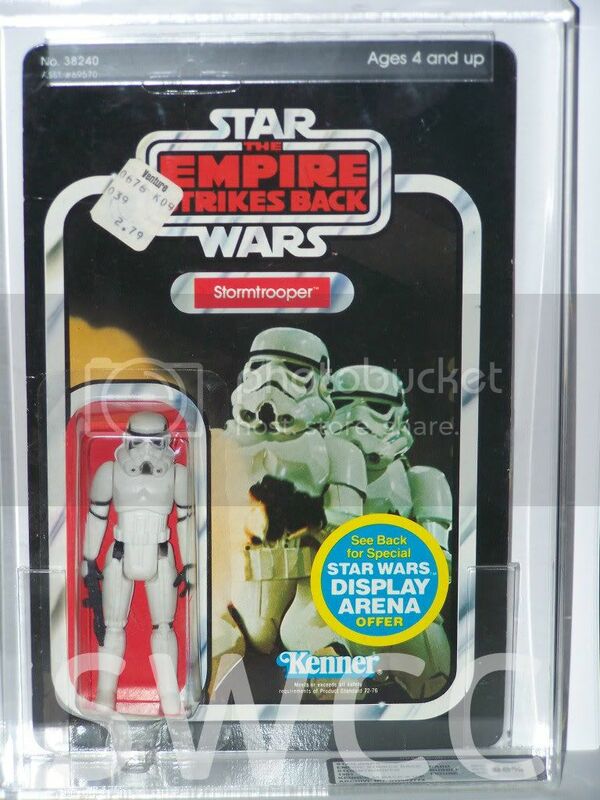 20 L front is the same as the 20 k the back has the secret figure offer sticker over the fett offers and extention stickers, what makes this an L is that there is an extention sticker over the top of the secret figure offer sticker, this is the only know example of this cardback. 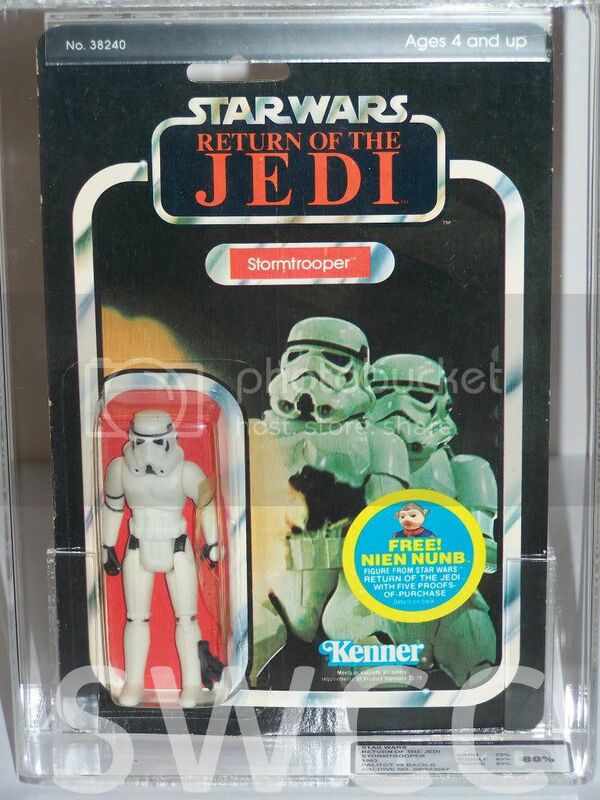 20 M i have given this cardback a designation of its own as it is unique in the fact that while it has the same front as the 20 c it has a rectangular offer extention sticker applied which was not used until later runs. 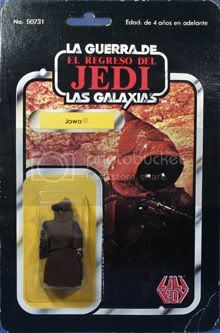 once again this is the only known example of this variation and is from a jawa. 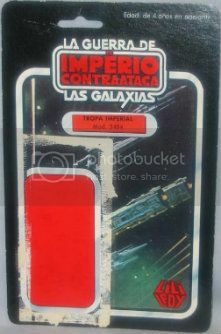 20 N i have given this cardback a designation of its own as it is unique in the fact that while it has the same front as the 20 c and the back of a 20 g the round offer sticker is larger in comparison, two known examples of this back are known to exist the main picture is from a leia organa and the comparison picture shows a standard g alongside a large bubble han with the same larger sticker. 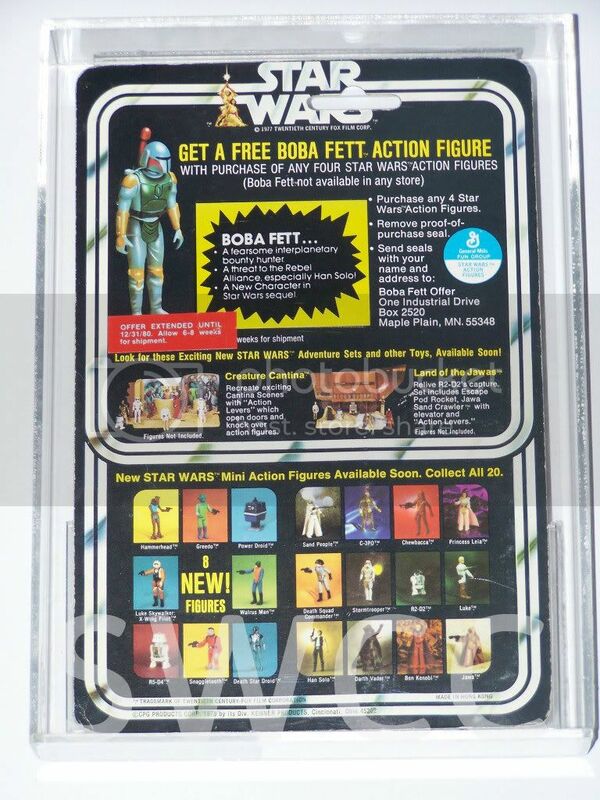 another variation of the same back, found again on a han solo this shows the yellow and black sticker with "boba fett" printed in a different font. 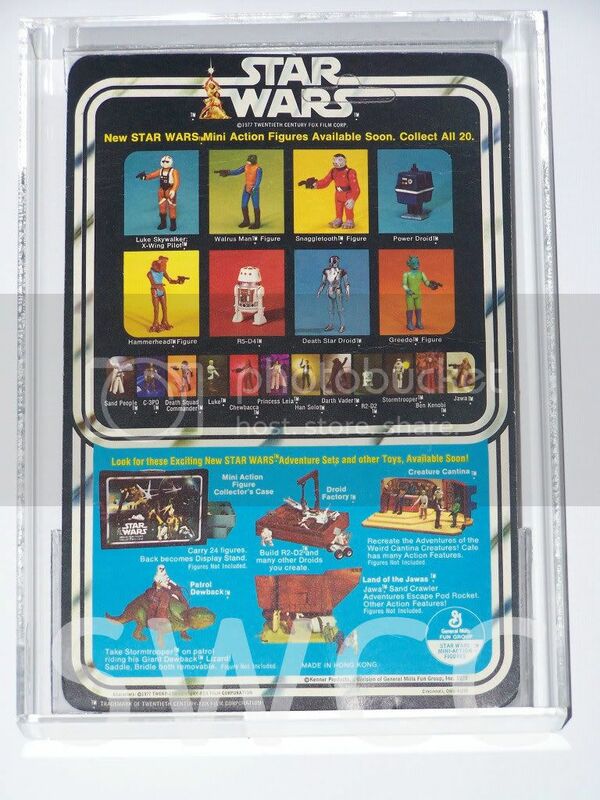 21 B the front of the card is the same as the 20 b the layout of the playsets is however different across the bottom. 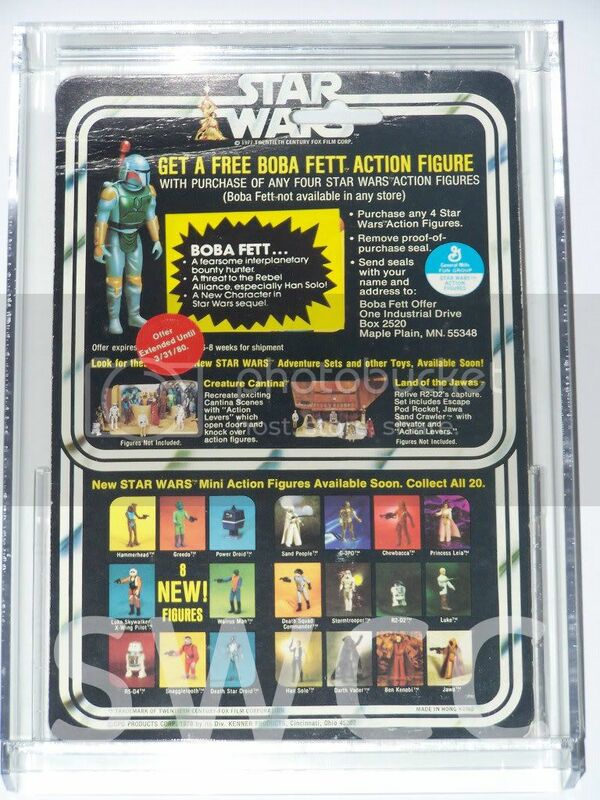 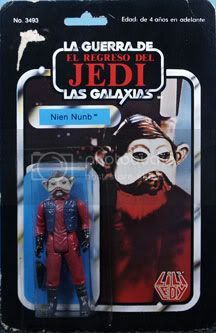 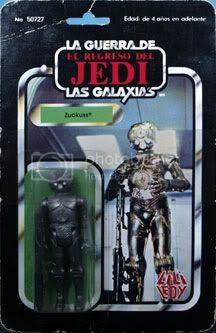 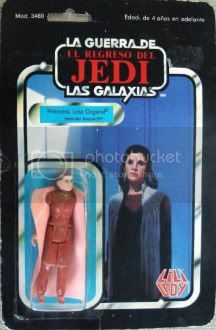 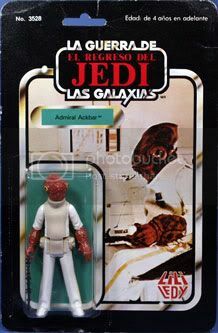 21 E front is the same as the 20 k, the back is the same as the 21 c with the addition of a round red sticker extending the offer and stating the secret figure is bossk. 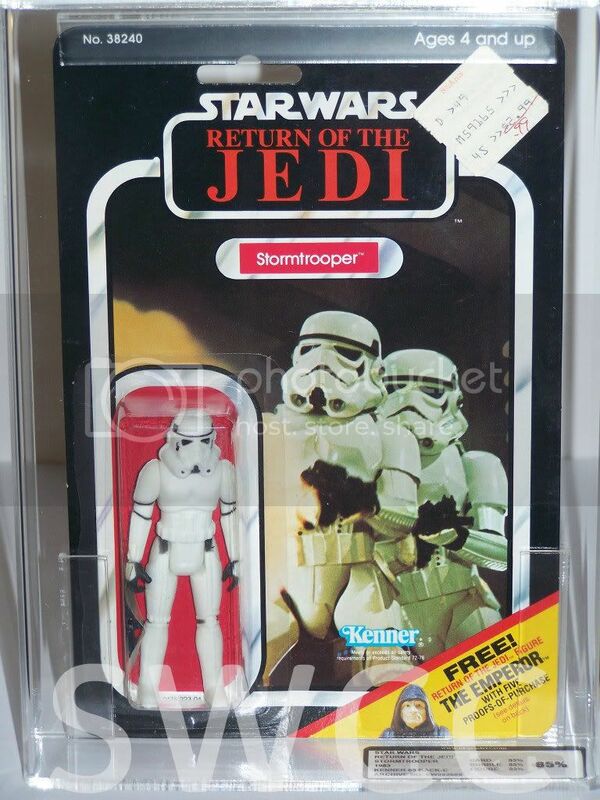 there is also another version of the 21 e with the same offer extending sticker over the sticker on the front of the card. 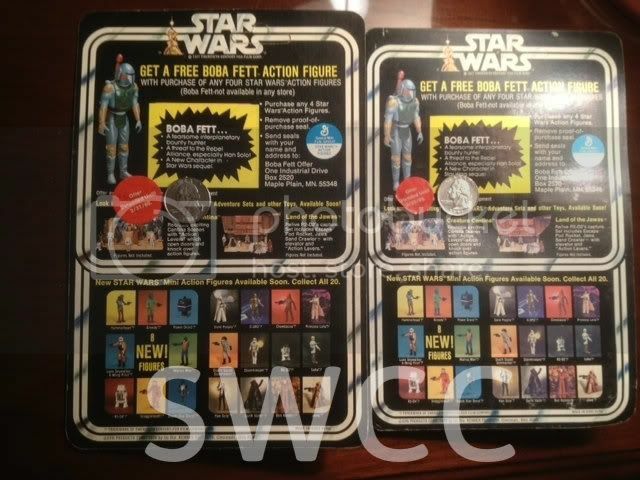 21 F front is the same as the 20 k and the back is the same as the 21 e with the addition of a small rectangular offer extention sticker. 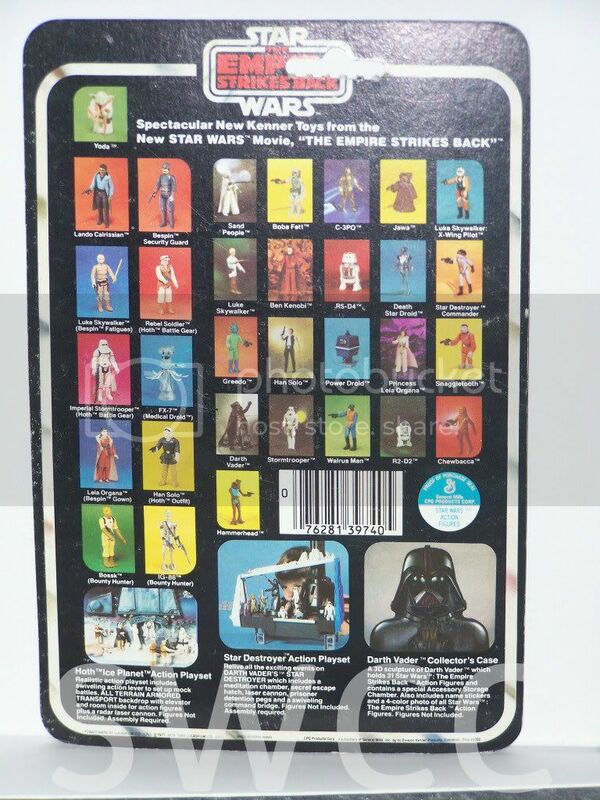 21 G THIS CARD MARKS THE START OF THE EMPIRE RUN the front is the same as the 20 a apart from a printed yellow and red starburst with the offer of a free secret star wars action figure. 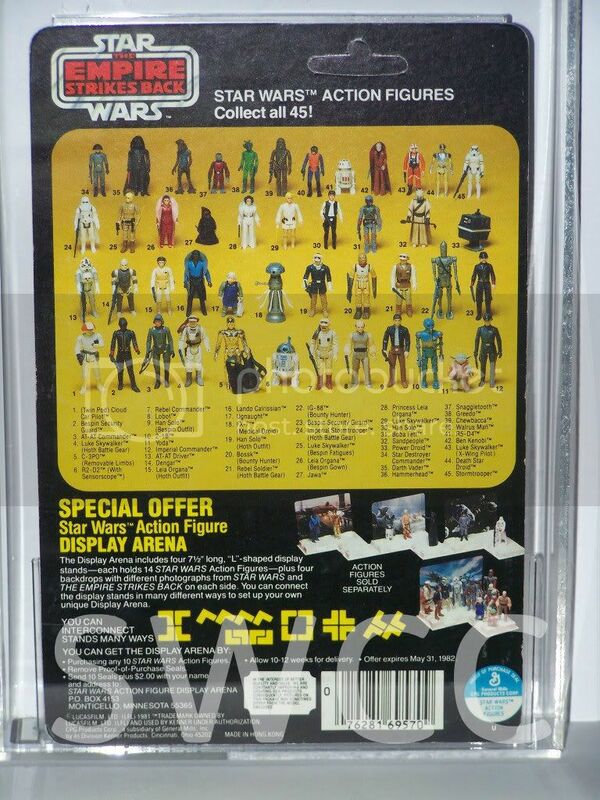 the back has 21 figures pictured across the top with a printed offer and details of how to appy across the bottom. 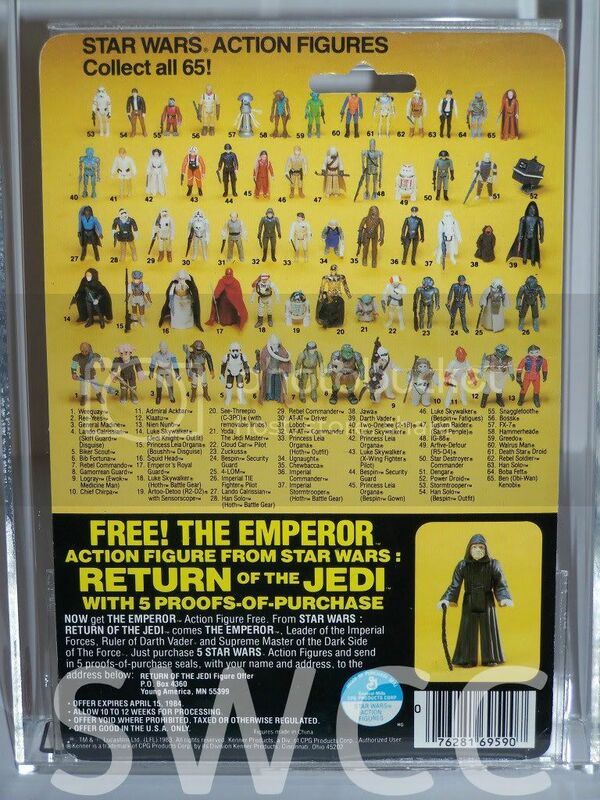 21 H front is the same as the 21 g the back is also the same with the addition of a small rectangular offer extending sticker. 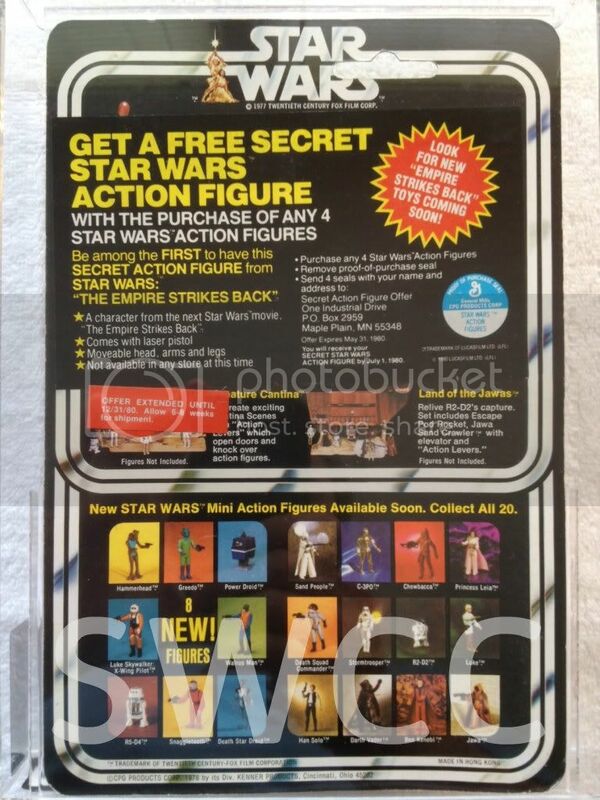 as with the 21 e there is also another version of the 21 h with the round offer extending sticker stating the secret figure is bossk over the printed starburst on the front of the card. 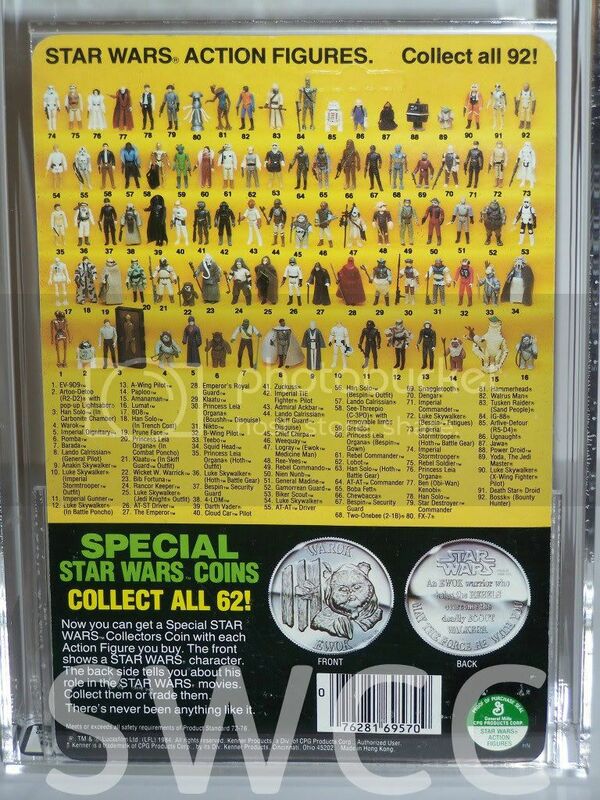 21 I front is the same as the 21 g the back is also the same with the addition of the round offer extending sticker stating the secret figure is bossk. 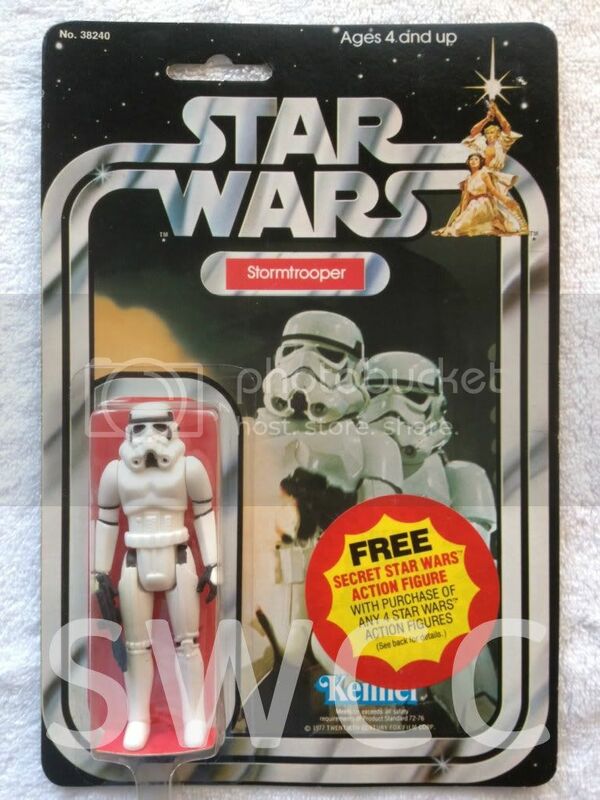 31 A the front is the same as the 21 g but without the starburst or any offer. 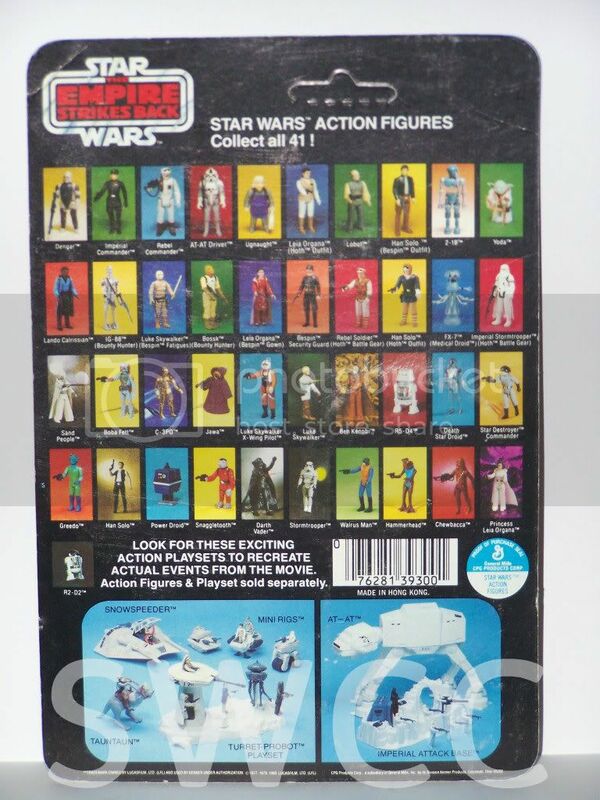 the back now shows 31 figures and has the pictures of the production snowspeeder, millennium falcon and imperial troop transporter across the bottom. 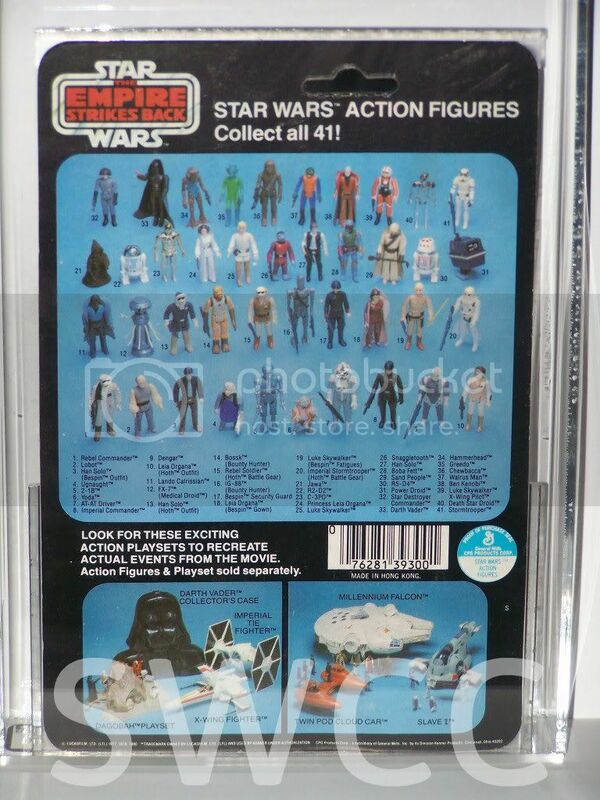 31 B the front and back are the same as the 31 a exept the pictures of the playsets have now changed to hoth ice planet, star destroyer and darth vader collectors case. 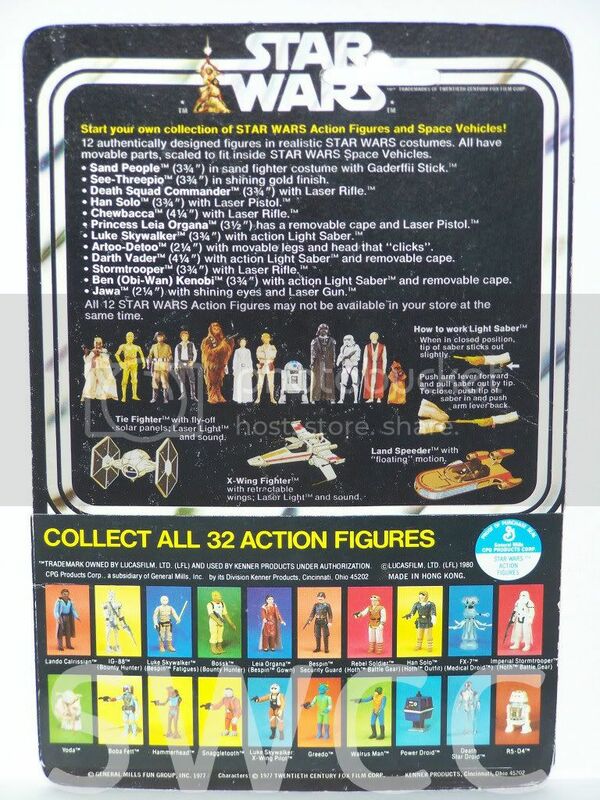 31 C front is the same as the 31 a but with the addition of a large round sticker with a yellow starburst and a red border offering a free star wars action figure survival kit. 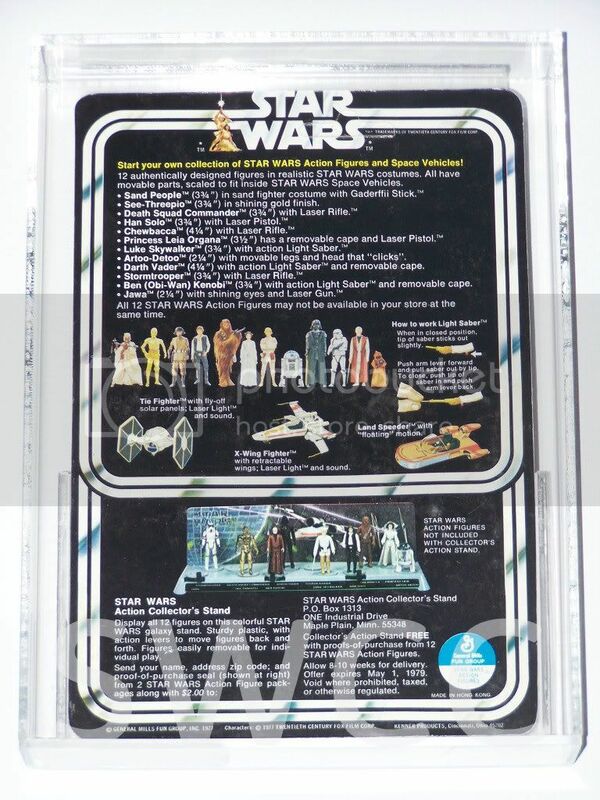 the back is the same as the 31 a but the card has a sticker detailing the survival kit offer across the bottom. 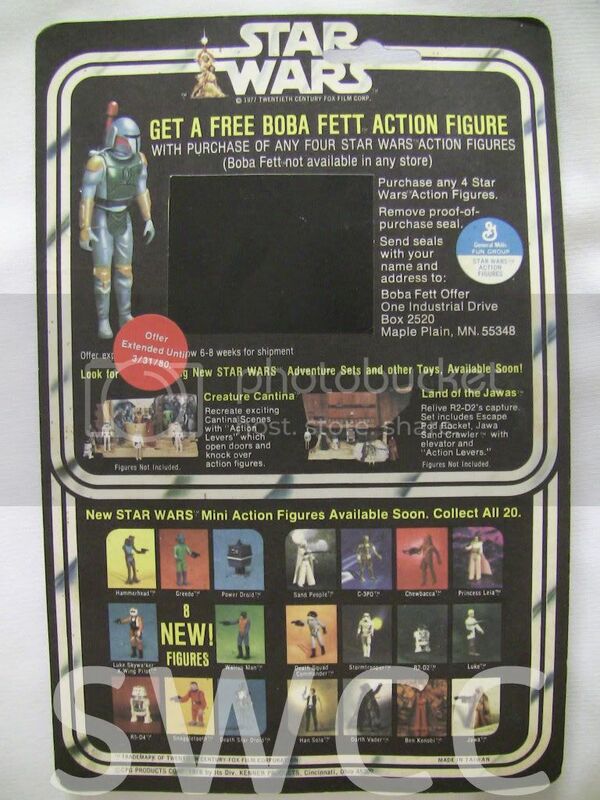 32 B front is the same as the 31 a the back is the same as the 31 b with the addition of a yoda figure in the top left of the card. 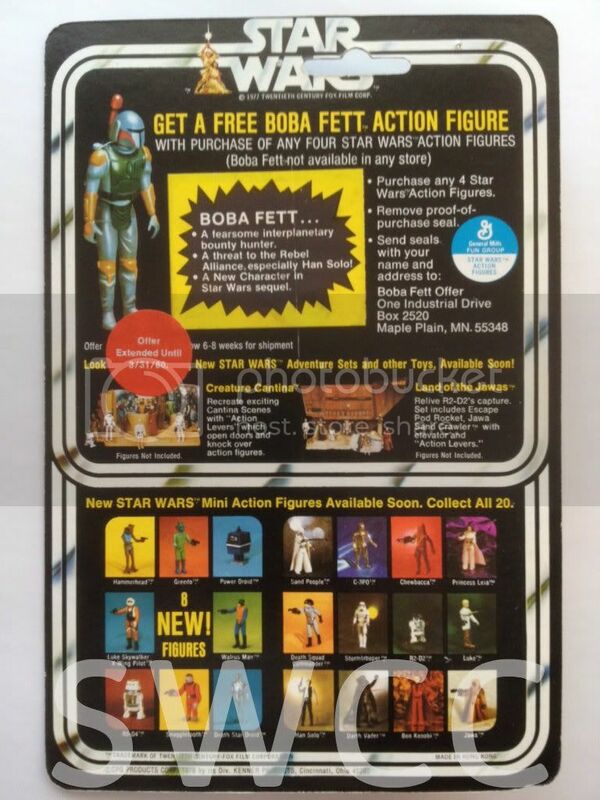 32 C front is the same as the 31 c, the back is the same as the 32 a with the addition of the same sticker as on the 31 c detailing the free survival kit offer across the bottom of the card. 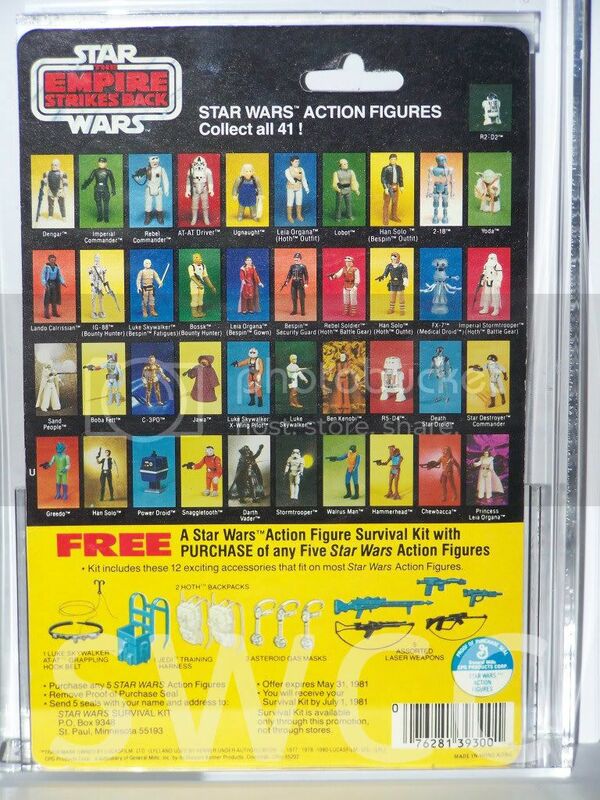 41 A front is the same as the 31 c but has the free survival kit offer printed but without the wide red border that the sticker on the 31,32 c had. 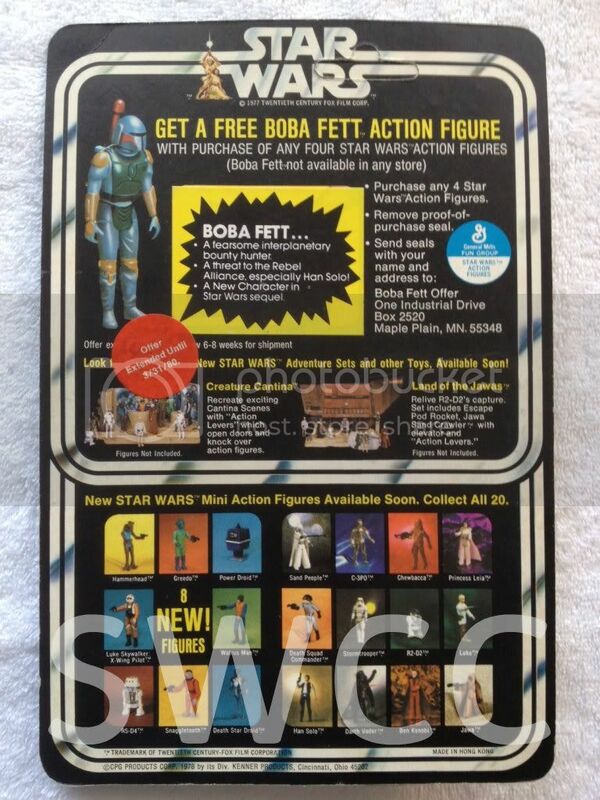 the back has the same offer that was stickerd on the 31,32 c now printed across the bottom of the card. 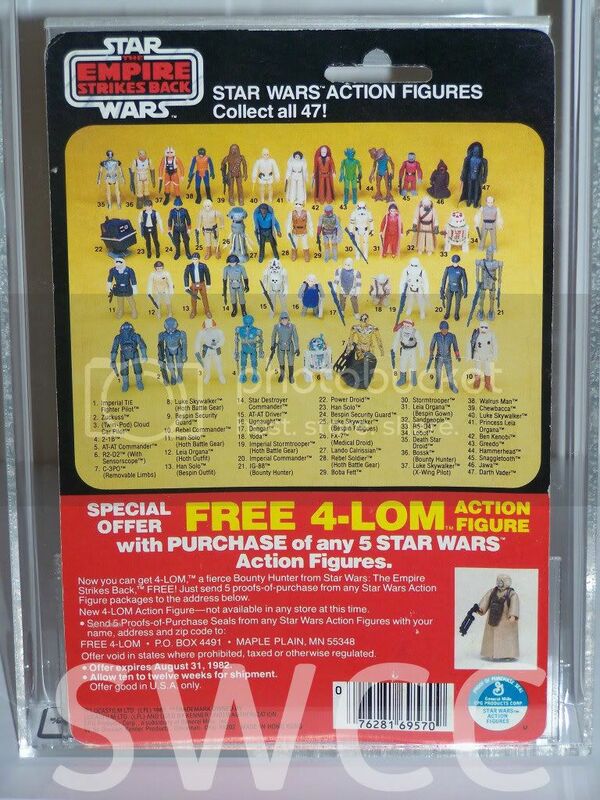 41 B front is the same as the 31 a and is offerless although the front does now show an asst code in the top left corner under the sku code for the figure as can be seen here. 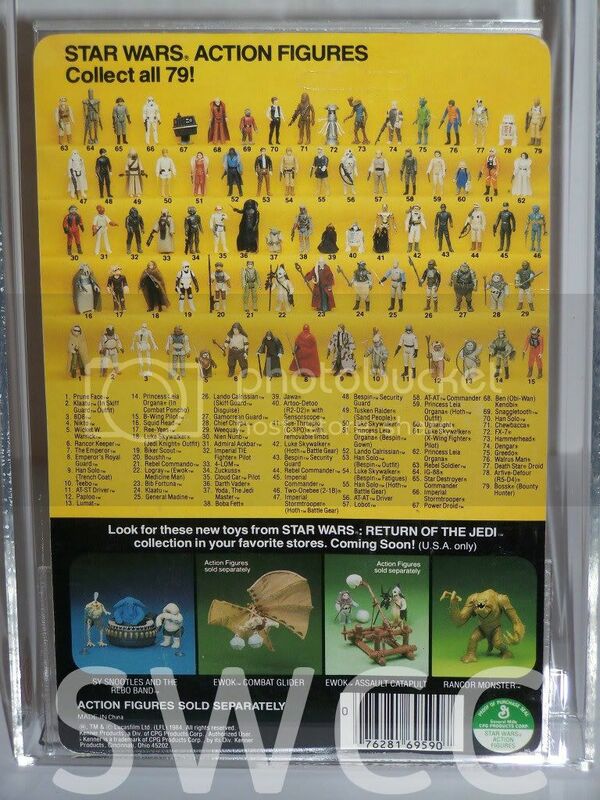 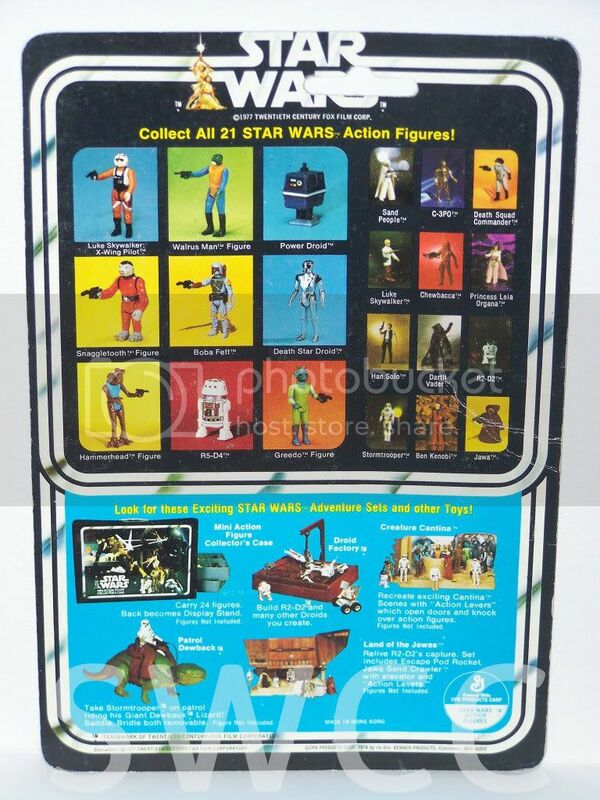 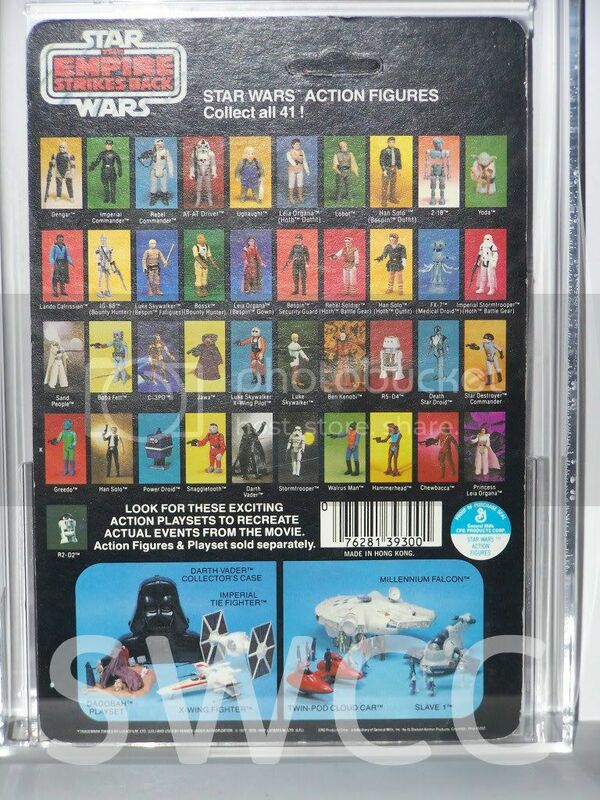 the back while similar has the r2 figure moved from top right to lower left and shows two groups of playsets, left is darth vader collectors case, imperial tie fighter, dagobah playset, x wing fighter. 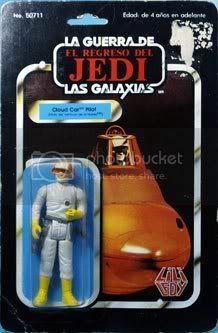 right shows slave 1, millennium falcon, twin pod cloud car. 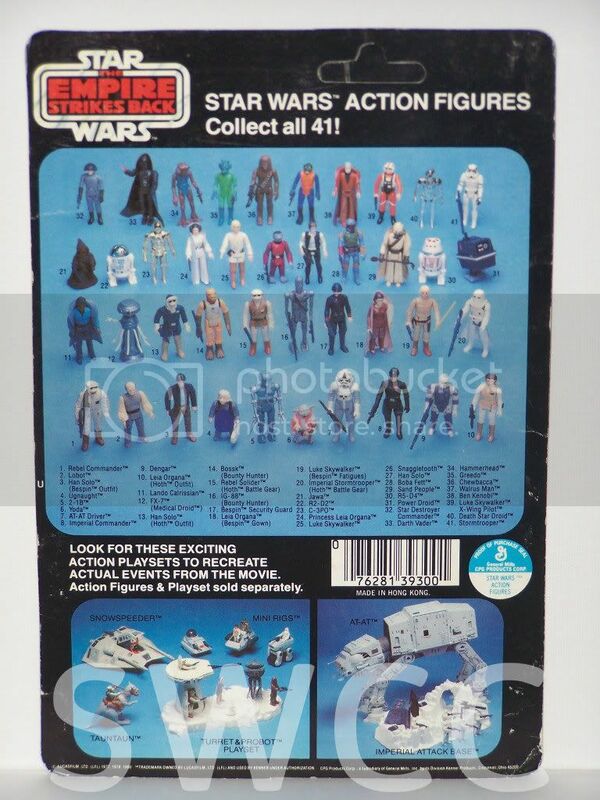 41 C front is the same as the 41 b including the asst code, back is the same as the 41 b except the playsets are now mini rigs, snowspeeder, turret probot playset, taun taun on the left and imperial attack base and at- at on the right. 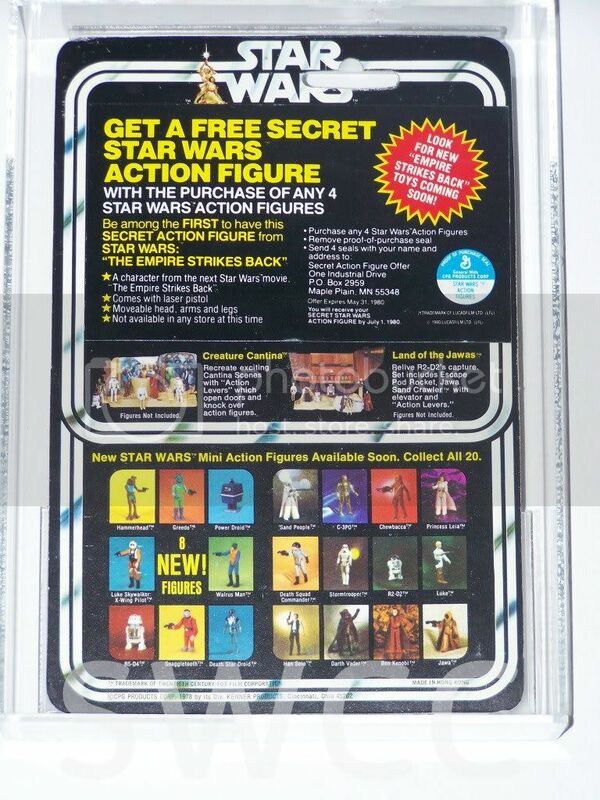 48 A front is the standard esb logo card and is offerless but now the asst code has been removed from the top left corner. 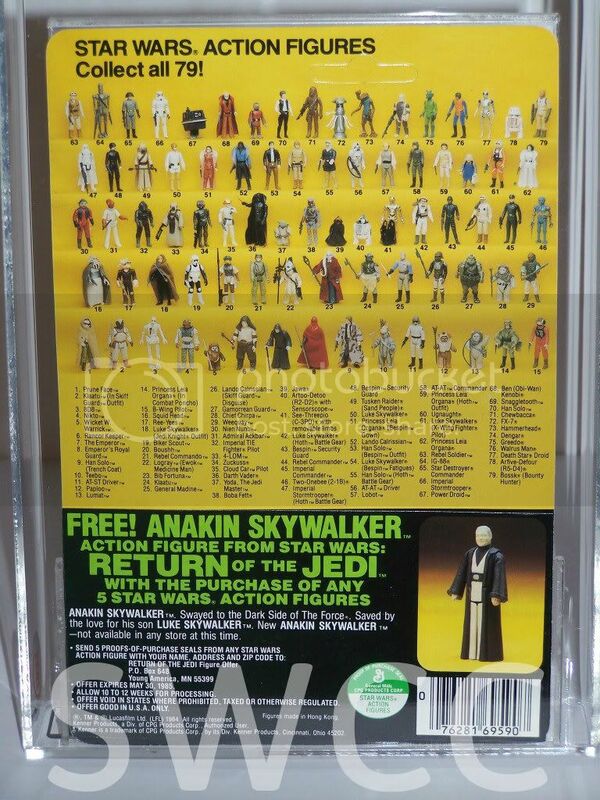 back shows the figures against a yellow background with black border and the bottom third shows details of the offer printed on the front, this photo shows a sticker added by palitoy for uk applicants. 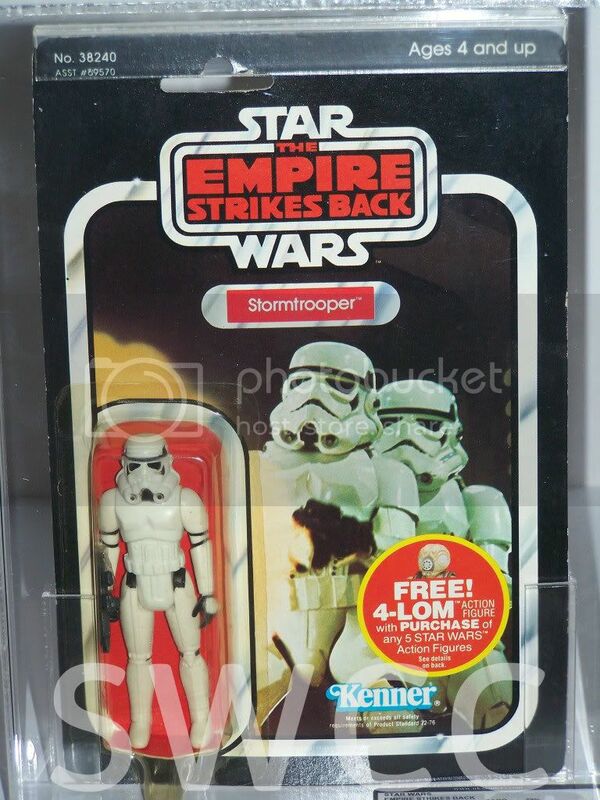 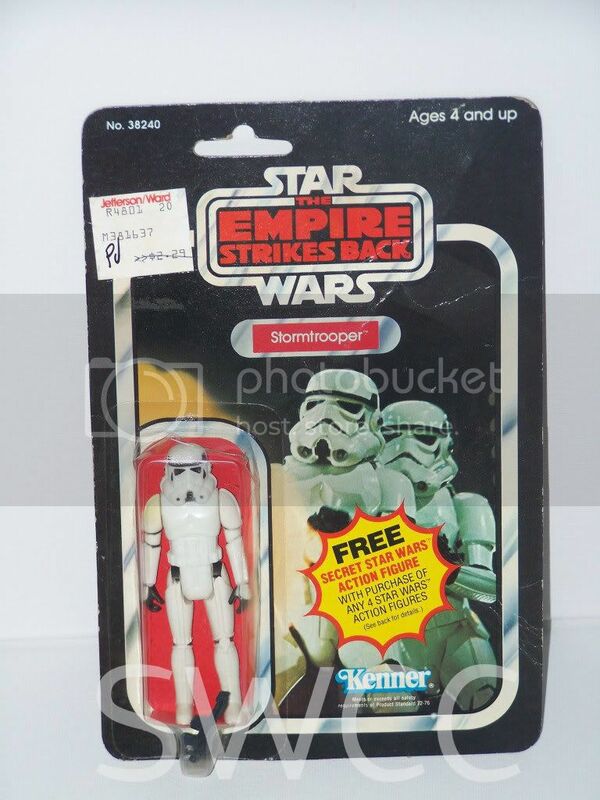 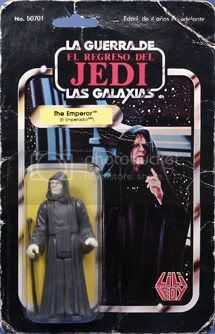 back is the same as the 65 b except the bottom third has the free emperor offer details. 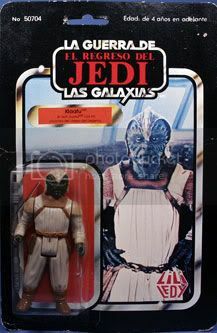 jimbody1 wrote: thankyou to lafos for allowing us to use his focus for the basis of this thread, if you have anything you think should be listed in this thread please let us know. 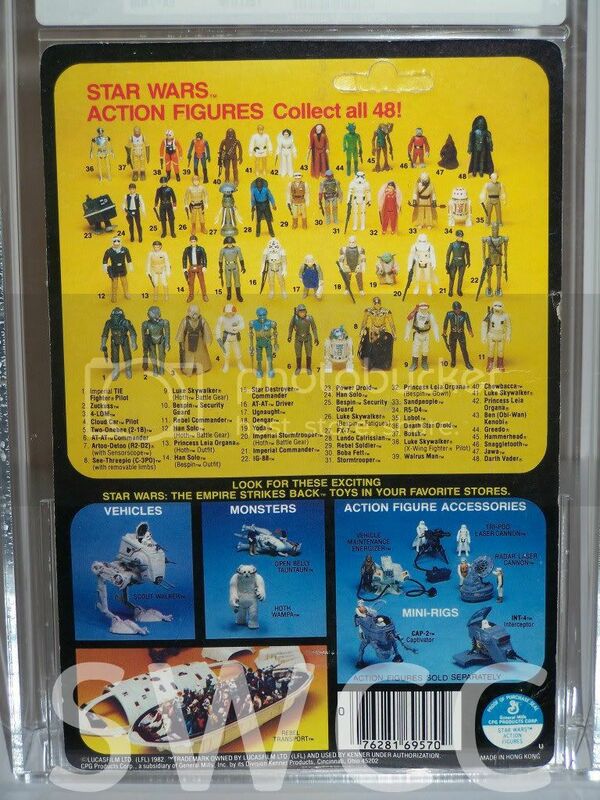 jimbody1 wrote: pictures for this have come from all over so you may have seen them before, if you have any cardback not listed please pm me with details and a picture. 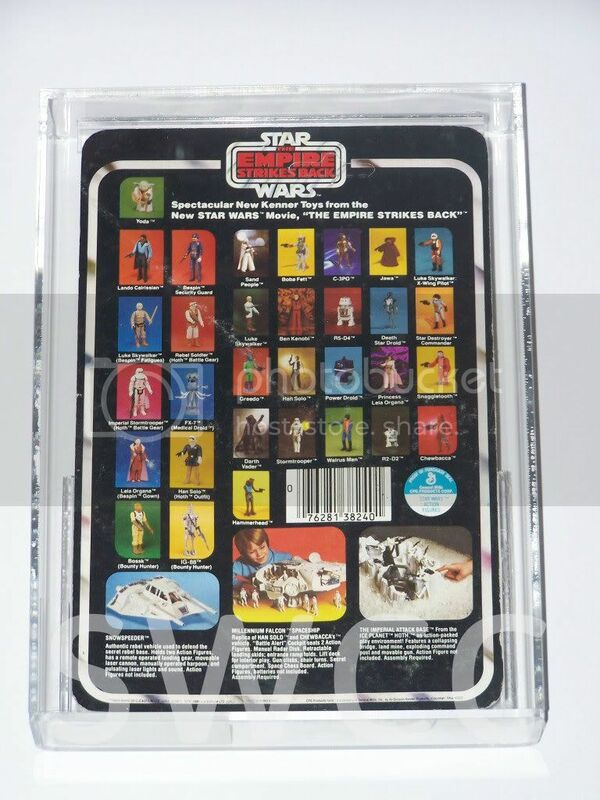 FROM THIS CARDBACK ONWARDS THE PALITOY LOGO WAS REMOVED FROM THE FRONT OF THE CARD. 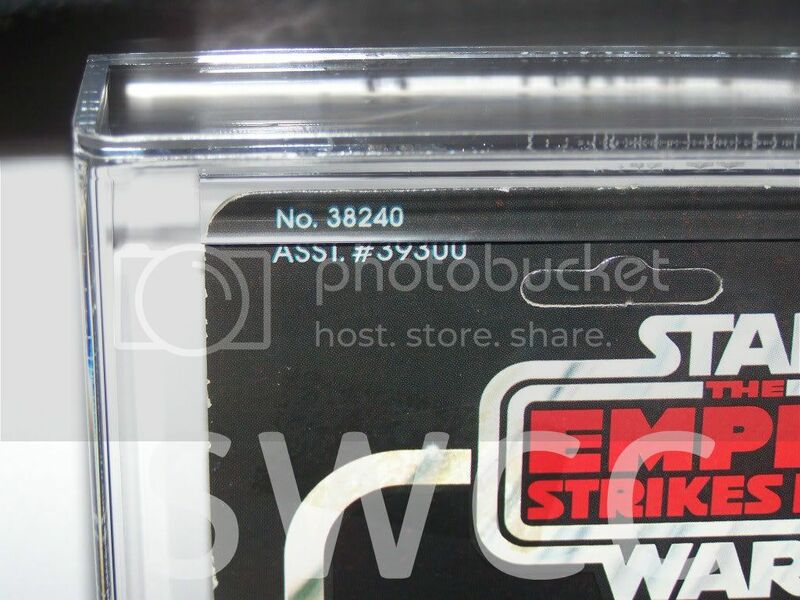 The card has a wide bottom border on the front with lucasfilm ltd in white on the bottom left of the border. 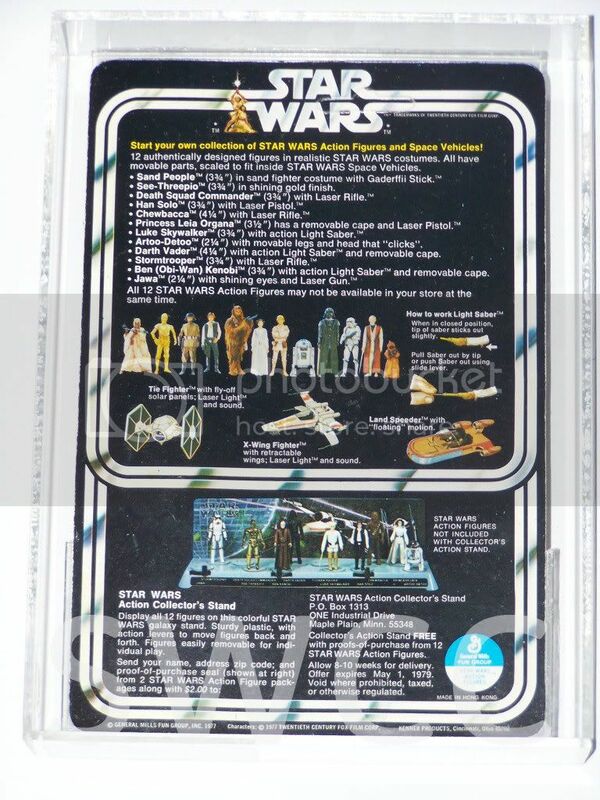 This card has a narrow bottom border on the front with lucasfilm ltd in black on the bubble border. 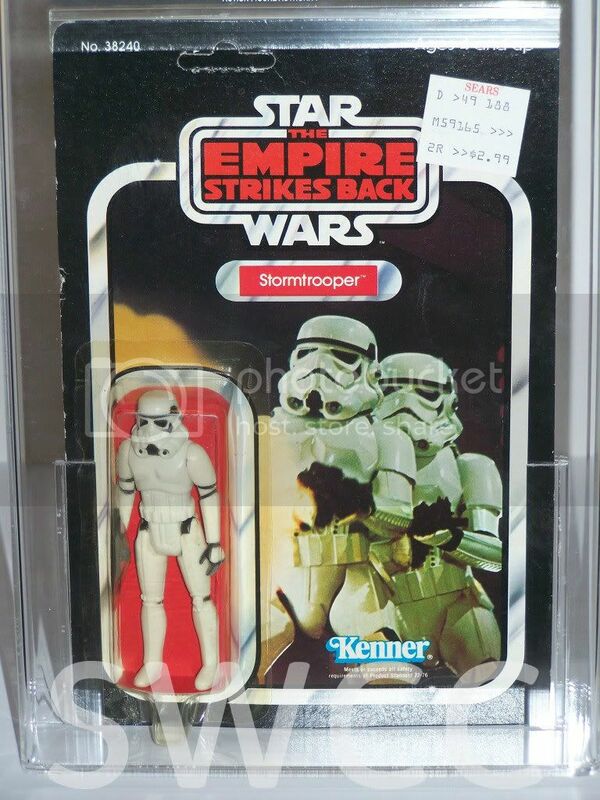 This card has nothing on the bottom or bubble border and usualy came with a big yellow £1.59 sticker applied at the factory somtimes before the bubble was applied. 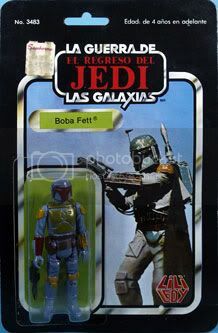 jimbody1 wrote: The cuts on both toltoys and the standard VC's are the same. 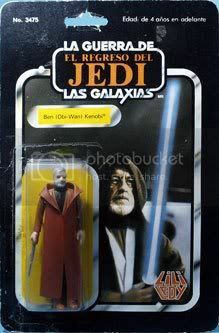 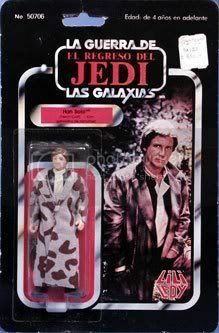 The Toltoys cape is a tad lighter/richer than the Ben cape plus the Toltoys cape has more of a shine on the outside than the Ben's. 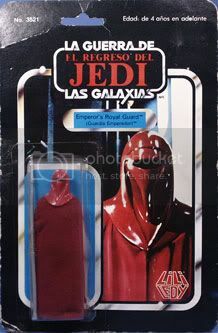 The Ben cape also has a slight texture inside which makes a zipping noise? 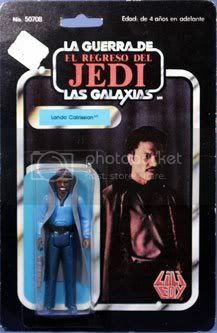 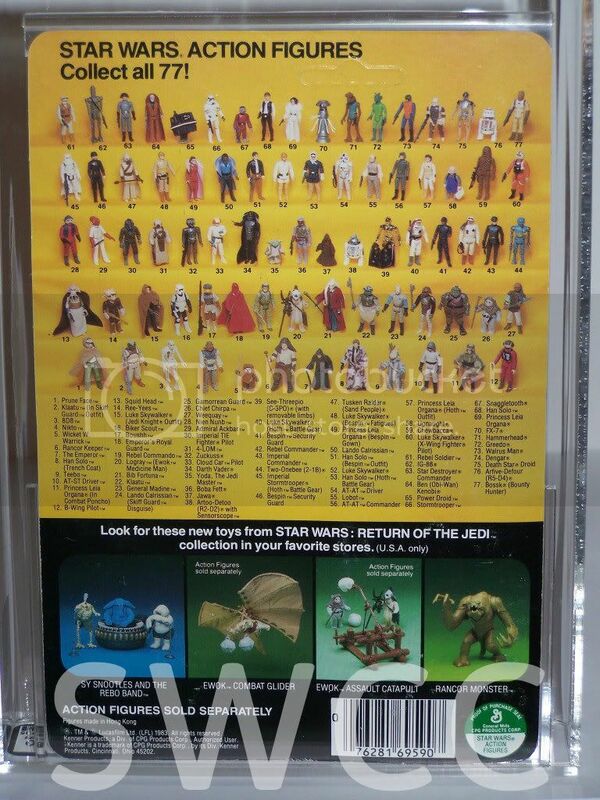 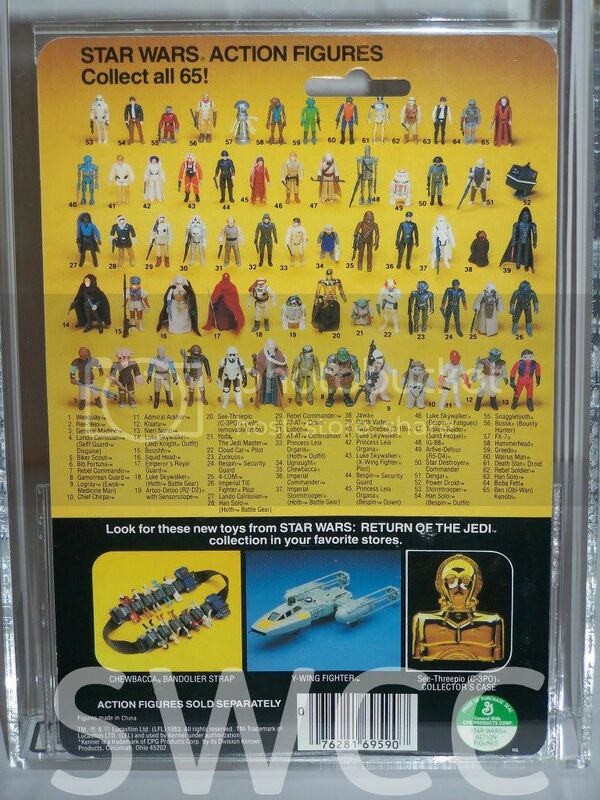 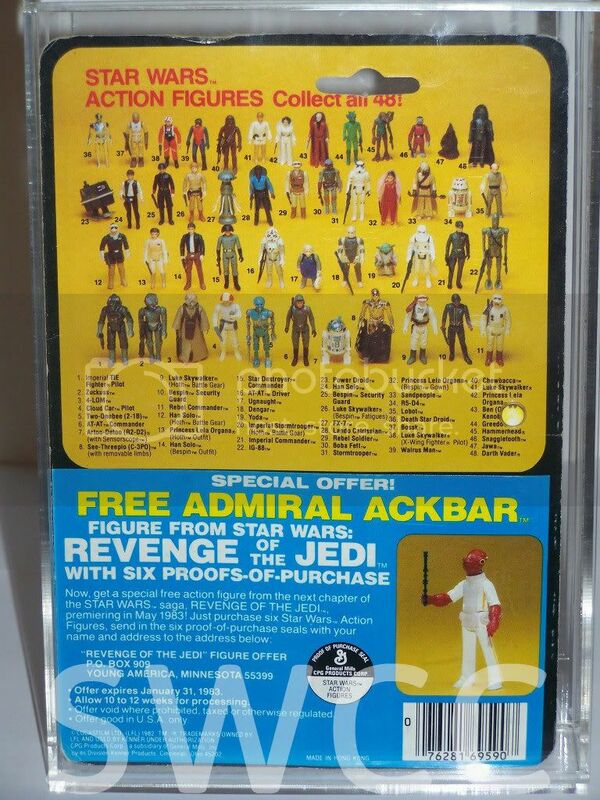 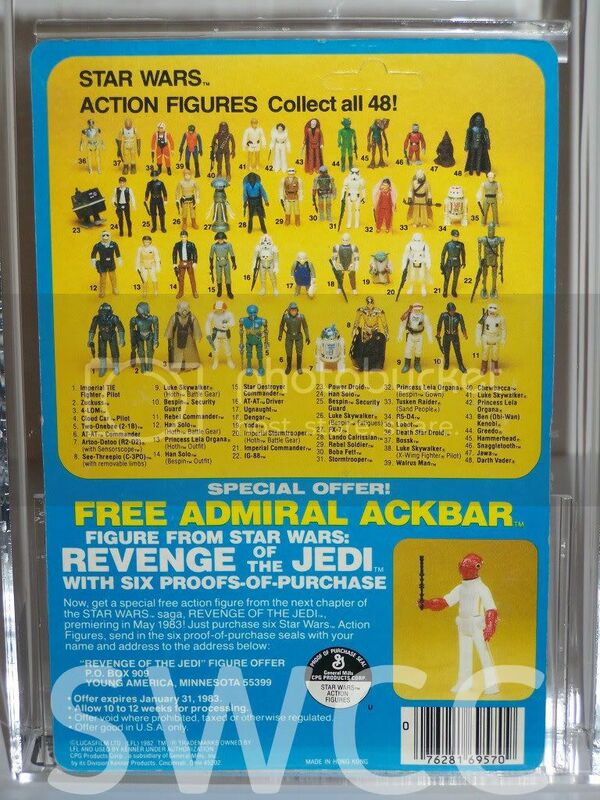 jimbody1 wrote: star wars multipacks were released between 1978-1982, below are the ones ive found so far. 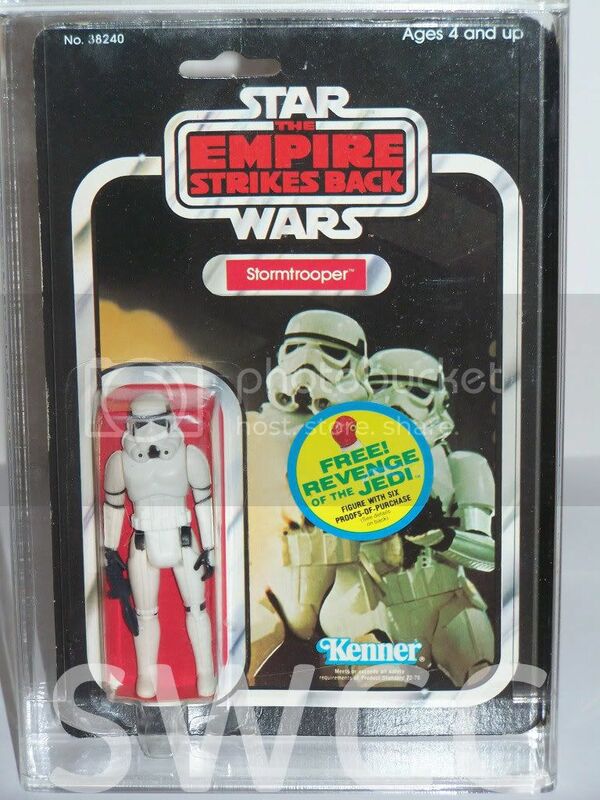 there are only two six packs released for esb as far as i know. 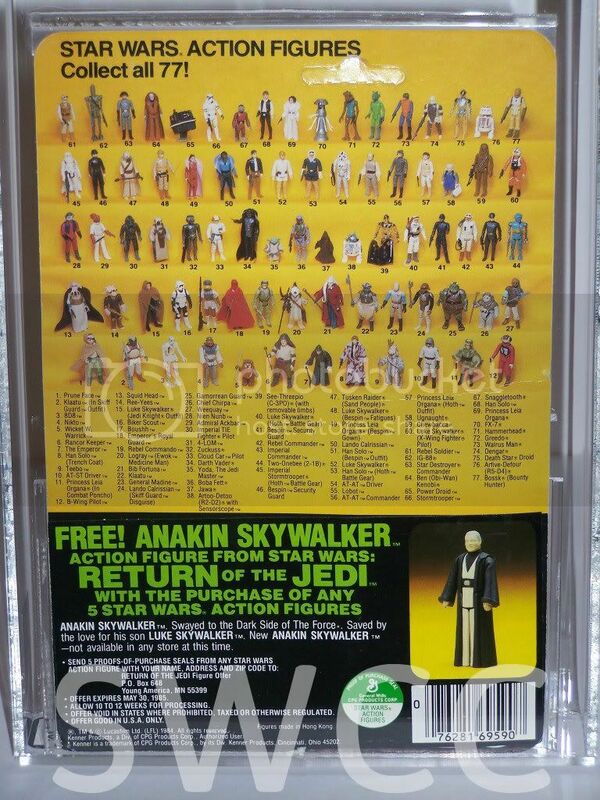 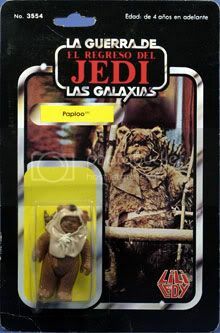 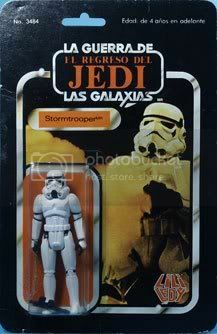 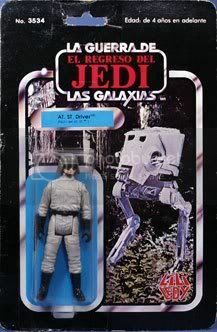 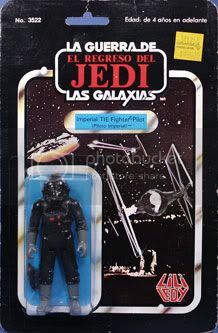 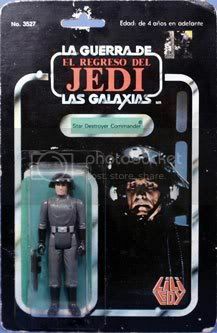 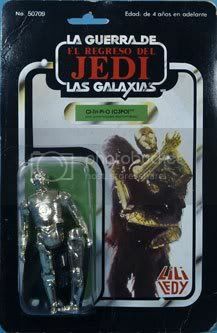 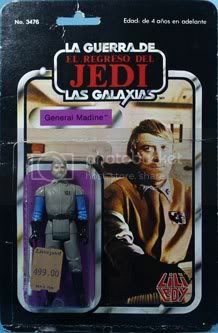 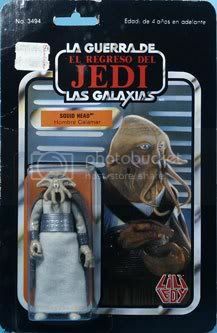 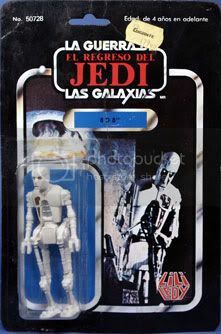 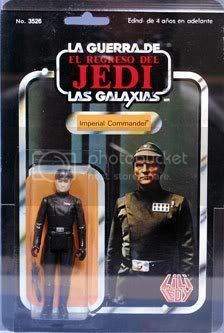 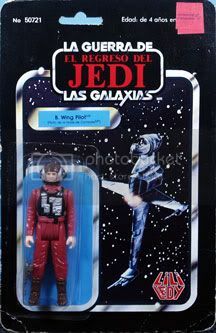 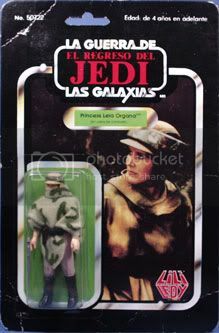 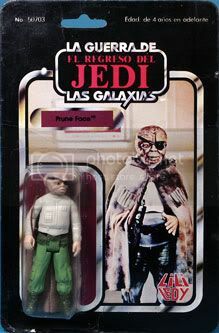 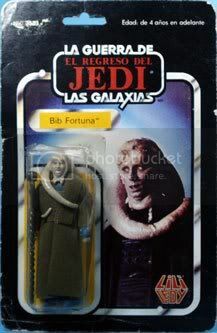 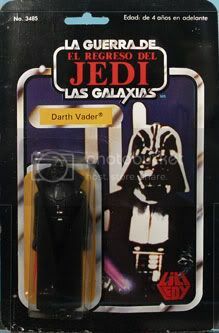 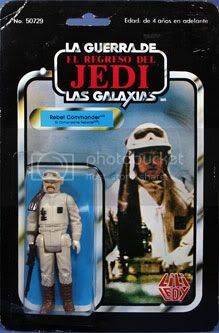 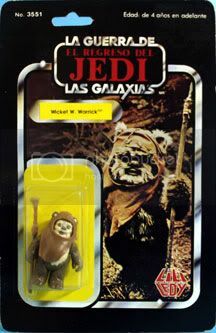 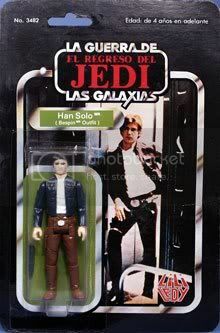 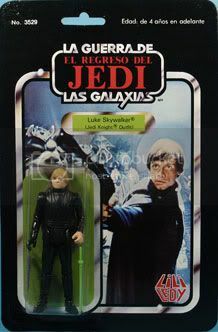 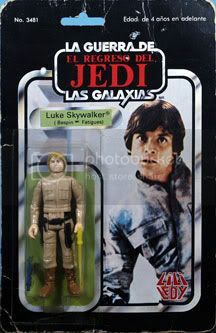 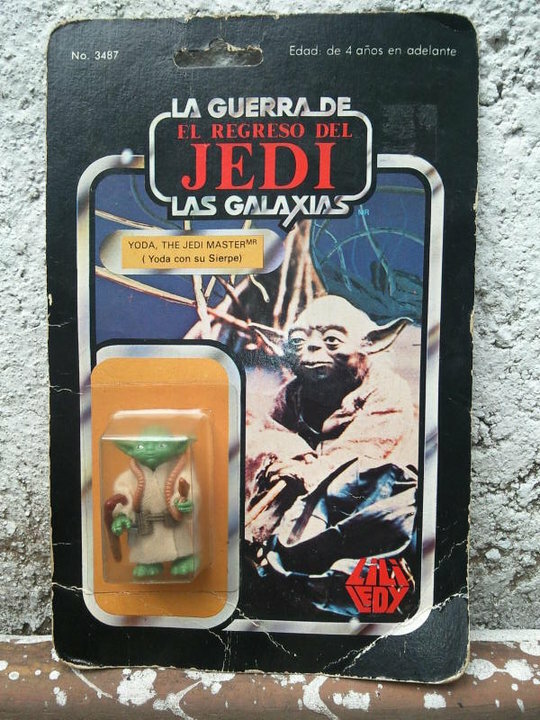 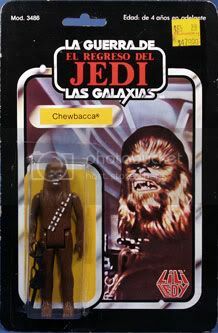 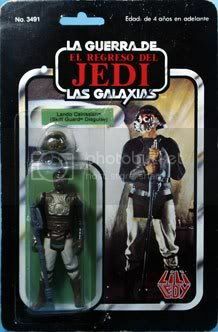 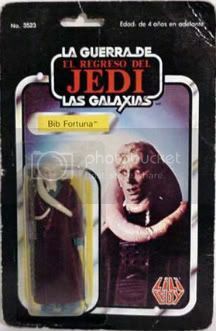 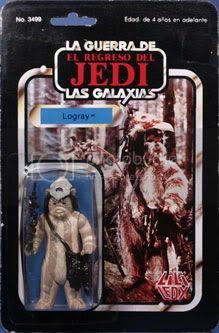 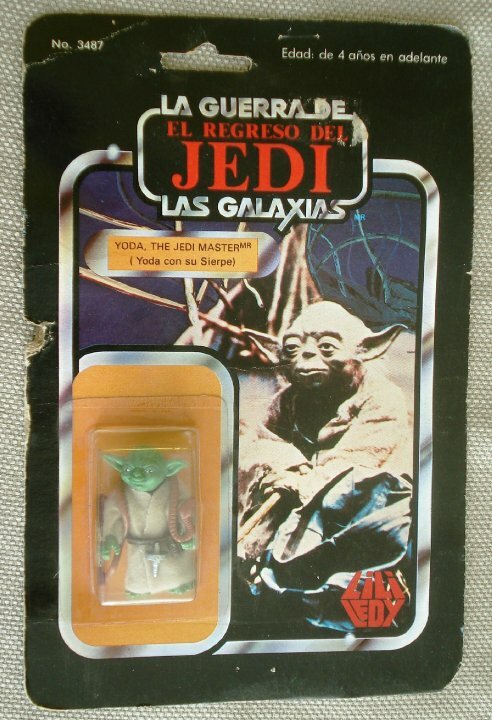 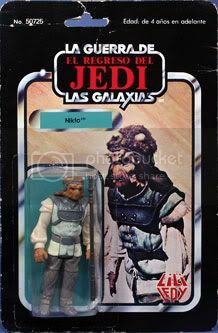 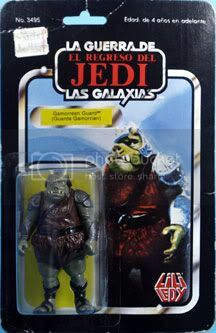 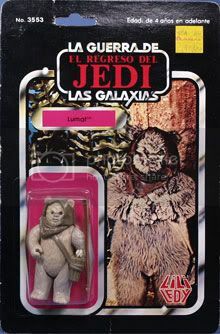 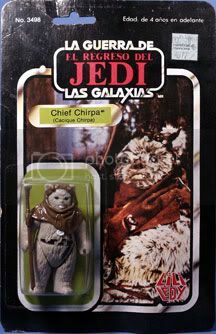 rotj 2 packs are probably endless in their variety, released from 1984-1985 most came without weapons and with realy crap bubbles usualy with one side larger than the other to accomodate larger figures such as the gg. 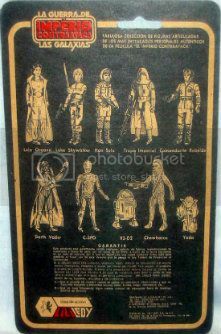 below is the pictures of the ones i can find. 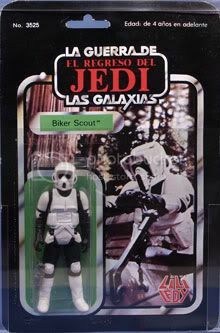 jimbody1 wrote: there are many mini rigs and ive tried to list them in the order of release. 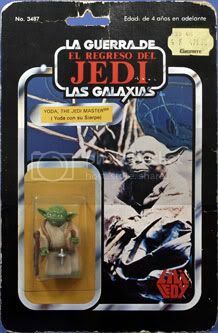 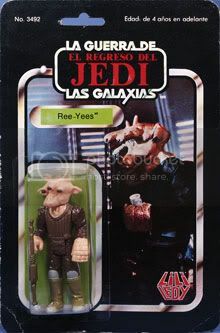 merlin wrote: here we have 3 different LL MOC Yodas 100% original!! 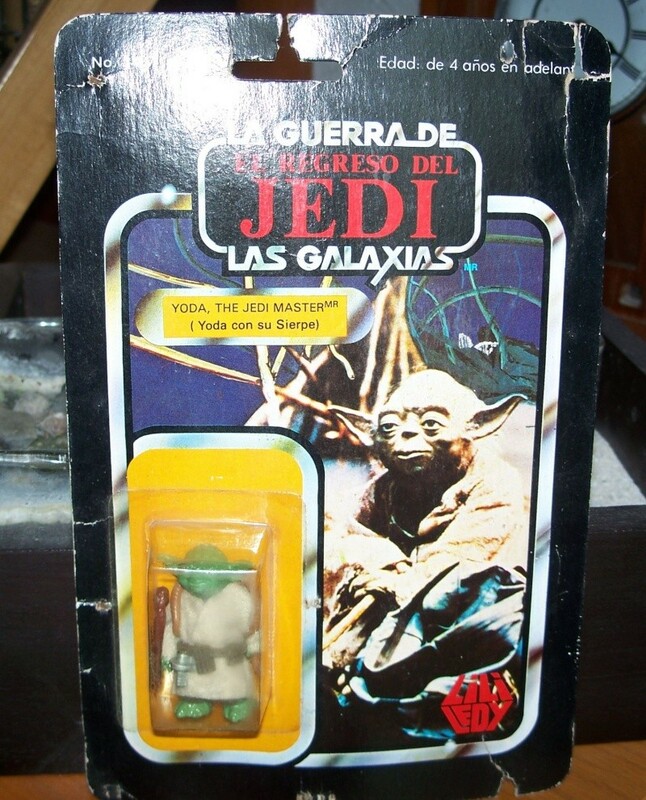 the First 2 yoda`s are back 30 the first one is negative and the second one is positive ( from different owners) and the last one is 14 back negative (mine), I assumed they didn`t use flash to take the pic, so I took the pic without flash, only use direct sunlight , so here is the funny thing , you can see the different colors they used in the three versions.... HAVE FUN!! 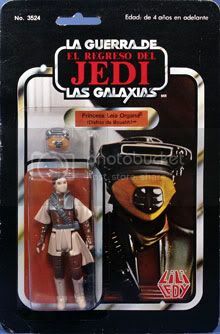 jimbody1 wrote: thanks to lafos for allowing the use of his focus for this thread, if you have an item you think is missing from this list please pm me with details.